The engineering model describes the problem and type of analysis to be done. It "knows" the type and form of governing equation, knows how to assemble this problem from local element contributions and uses suitable instance of numerical method class to solve problem. It possesses and manages one or more problem domains. Concept of time steps is introduced. For problems discretized in time the introduction of time step is natural. In other cases, time steps can represent for example load increments or different load cases. The solution steps are grouped together into so called meta steps. The meta step can be thought as an sequence of solution steps, with same set of attributes used to drive behavior of engng model. For each metastep, the engng model typically updates its control attributes according to metastep engng attributes (see initMetaStepAttributes and updateAttributes services) and creates the solution steps accordingly. This allows to switch to different time increment, different solution control, etc. If no metastep is specified, the engng model creates default one for all required solution steps. There are two services, where attributes are updated, the first one, used for those attributes, which do not vary during solution of problem are set in initializeFrom service. The second service is updateAttributes, where the attributes allowed to change (with metastep validity) are updated. If no metastep is introduced, default one is created (with attributes set to engng model init record). Then there is no difference, whether attributes are read in initializeFrom or updateAttributes, but preferred scheme is to read all attributes in initializeFrom and left updateAttributes service empty. Solving the problem described by governing equation(s) using suitable instance of numerical method. This requires interfacing numericalMethod characteristic elements with components in governing equation EngngModel must map each component of governing equation(s) (which has physical meaning) to corresponding numerical component of Numerical method. This mapping between physical components to independent numerical components (understood by numerical method) is important, because it allows numerical method to be used by many EngngModel with different meaning of particular components. Returning unknown values (according to requested type and mode). Used by Dofs to access their corresponding unknowns. Terminating time step by updating nodal and element values (including integration points update). Updating dofs unknowns dictionaries if model supports changes of static system (see Dof class documentation for detailed explanation). In general if static system changes are not supported, when dof are requested for unknowns, they use their associate equation number to ask EngngModel for this unknown. Unknowns are therefore stored in EngngModel and are requested by dofs. On the other hand, when static system changes are supported, the equation numbers of dofs can vary during solution. Therefore, so called unknowns dictionary at dof level are introduced. All unknowns are stored on dof level and dofs will use in such case their own dictionaries instead of requesting EngngModel. The EngngModel is fully responsible to update this dictionary for each dof with all necessary unknowns (see updateDofUnknownsDictionary function). Definition at line 181 of file engngm.h. Definition at line 309 of file engngm.h. Definition at line 184 of file engngm.h. Definition at line 185 of file engngm.h. Means to choose methods for finding a good initial guess. This is ad-hoc methods, often problem-specific for obtaining a point from which Newton iterations work. Only nonlinear analysis needs to worry about this. No special treatment for new iterations. Probably means ending up using for all free dofs. Solves an approximated tangent problem from the last iteration. Useful for changing Dirichlet boundary conditions. Definition at line 197 of file engngm.h. Creates Engng model with number i. Definition at line 89 of file engngm.C. References oofem::_processor, oofem::COM_NoContext, comm, commBuff, communicator, context, contextOutputMode, contextOutputStep, defaultErrEstimator, equationNumberingCompleted, exportModuleManager, force_load_rebalance_in_first_step, giveContext(), initModuleManager, lb, lbm, loadBalancingFlag, oofem::macroScale, master, ndomains, nMetaSteps, nonLinFormulation, nonlocalExt, nonlocCommunicator, number, numberOfEquations, numberOfPrescribedEquations, numberOfSteps, numProcs, outputStream, parallelFlag, pMode, profileOpt, pScale, rank, referenceFileName, renumberFlag, suppressOutput, and oofem::UNKNOWN. Definition at line 143 of file engngm.C. References commBuff, communicator, context, defaultErrEstimator, exportModuleManager, initModuleManager, lb, lbm, loadBalancingFlag, master, nonlocCommunicator, and outputStream. Assembles characteristic matrix of required type into given sparse matrix. tStep Time step, when answer is assembled. s Determines the equation numbering scheme. type Characteristic components of type type are requested from elements and assembled. : Some active bcs still make changes even when they are not applied We should probably reconsider this approach, so that they e.g. just prescribe their lagrange mult. instead. Reimplemented in oofem::NonLinearStatic, and oofem::NonLinearDynamic. Definition at line 803 of file engngm.C. References oofem::SparseMtrx::assemble(), oofem::SparseMtrx::assembleBegin(), oofem::SparseMtrx::assembleEnd(), oofem::MatrixAssembler::assembleFromActiveBC(), oofem::FloatMatrix::clear(), oofem::Element_remote, oofem::EngngModelTimer::EMTT_NetComputationalStepTimer, oofem::Domain::giveBcs(), oofem::Domain::giveElement(), oofem::Domain::giveNumberOfElements(), oofem::Domain::giveSet(), oofem::Domain::hasContactManager(), isElementActivated(), oofem::FloatMatrix::isNotEmpty(), oofem::MatrixAssembler::locationFromElement(), oofem::MatrixAssembler::locationFromElementNodes(), oofem::MatrixAssembler::matrixFromEdgeLoad(), oofem::MatrixAssembler::matrixFromElement(), oofem::MatrixAssembler::matrixFromLoad(), oofem::MatrixAssembler::matrixFromSurfaceLoad(), OOFEM_ERROR, oofem::EngngModelTimer::pauseTimer(), oofem::EngngModelTimer::resumeTimer(), oofem::FloatMatrix::rotatedWith(), and timer. Referenced by oofem::NonLinearDynamic::assemble(), oofem::NonLinearStatic::assemble(), oofem::StokesFlowVelocityHomogenization::computeTangent(), oofem::PrescribedGradientBCNeumann::computeTangent(), oofem::PrescribedGradientBCPeriodic::computeTangent(), oofem::TransportGradientNeumann::computeTangent(), oofem::TransportGradientPeriodic::computeTangent(), oofem::PrescribedGradient::computeTangent(), oofem::PrescribedGenStrainShell7::computeTangent(), oofem::TransportGradientDirichlet::computeTangent(), oofem::PrescribedGradientBCWeak::computeTangent(), oofem::MixedGradientPressureWeakPeriodic::computeTangents(), oofem::MixedGradientPressureDirichlet::computeTangents(), oofem::MixedGradientPressureNeumann::computeTangents(), oofem::MicroMaterial::giveMacroStiffnessMatrix(), oofem::NLTransientTransportProblem::solveYourselfAt(), oofem::StationaryTransportProblem::solveYourselfAt(), oofem::LinearStatic::solveYourselfAt(), oofem::FreeWarping::solveYourselfAt(), oofem::EigenValueDynamic::solveYourselfAt(), oofem::IncrementalLinearStatic::solveYourselfAt(), oofem::LinearStability::solveYourselfAt(), oofem::DIIDynamic::solveYourselfAt(), oofem::NonStationaryTransportProblem::solveYourselfAt(), oofem::SUPG::solveYourselfAt(), oofem::CBS::solveYourselfAt(), oofem::DarcyFlow::updateComponent(), oofem::StationaryTransportProblem::updateComponent(), oofem::TransientTransportProblem::updateComponent(), oofem::StaticStructural::updateComponent(), oofem::StokesFlow::updateComponent(), and oofem::SUPG::updateComponent(). r_s Determines the equation numbering scheme for the rows. c_s Determines the equation numbering scheme for the columns. Definition at line 928 of file engngm.C. References oofem::SparseMtrx::assemble(), oofem::SparseMtrx::assembleBegin(), oofem::SparseMtrx::assembleEnd(), oofem::MatrixAssembler::assembleFromActiveBC(), oofem::Element_remote, oofem::EngngModelTimer::EMTT_NetComputationalStepTimer, oofem::Domain::giveBcs(), oofem::Domain::giveElement(), oofem::Domain::giveNumberOfElements(), oofem::Element::giveParallelMode(), oofem::Element::giveRotationMatrix(), oofem::Domain::hasContactManager(), oofem::Element::isActivated(), isElementActivated(), oofem::FloatMatrix::isNotEmpty(), oofem::MatrixAssembler::locationFromElement(), oofem::MatrixAssembler::matrixFromElement(), OOFEM_ERROR, oofem::EngngModelTimer::pauseTimer(), oofem::EngngModelTimer::resumeTimer(), oofem::FloatMatrix::rotatedWith(), and timer. Assembles the extrapolated internal forces vector, useful for obtaining a good initial guess in nonlinear analysis with Dirichlet boundary conditions. type Determines the type of matrix to use, typically the tangent matrix or possibly the elastic tangent. domain Domain to assemble from. Sum of element norm (squared) of assembled vector. Temporary work-around for active b.c. used in multiscale (it can't support VM_Incremental easily). Definition at line 1341 of file engngm.C. References oofem::FloatArray::assemble(), oofem::FloatArray::beProductOf(), oofem::Element::computeVectorOf(), oofem::Element_remote, oofem::EngngModelTimer::EMTT_NetComputationalStepTimer, oofem::Element::giveCharacteristicMatrix(), oofem::Domain::giveElement(), oofem::Element::giveLocationArray(), oofem::Domain::giveNumber(), giveNumberOfDomainEquations(), oofem::Domain::giveNumberOfElements(), oofem::Element::giveParallelMode(), oofem::TimeStep::givePreviousStep(), oofem::Element::giveRotationMatrix(), oofem::Element::isActivated(), isElementActivated(), oofem::FloatMatrix::isNotEmpty(), oofem::TimeStep::isTheFirstStep(), oofem::EngngModelTimer::pauseTimer(), oofem::FloatArray::resize(), oofem::EngngModelTimer::resumeTimer(), oofem::FloatArray::rotatedWith(), oofem::FloatArray::subtract(), timer, and oofem::FloatArray::zero(). Definition at line 1417 of file engngm.C. References oofem::FloatArray::assemble(), oofem::FloatArray::beProductOf(), oofem::Element::computeVectorOfPrescribed(), oofem::Element_remote, oofem::EngngModelTimer::EMTT_NetComputationalStepTimer, oofem::Element::giveCharacteristicMatrix(), oofem::Domain::giveElement(), oofem::Element::giveLocationArray(), oofem::Domain::giveNumber(), giveNumberOfDomainEquations(), oofem::Domain::giveNumberOfElements(), oofem::Element::giveParallelMode(), oofem::Element::giveRotationMatrix(), oofem::Element::isActivated(), oofem::FloatMatrix::isNotEmpty(), oofem::EngngModelTimer::pauseTimer(), oofem::FloatArray::resize(), oofem::EngngModelTimer::resumeTimer(), oofem::FloatArray::rotatedWith(), timer, and oofem::FloatArray::zero(). Assembles characteristic vector of required type from dofManagers, element, and active boundary conditions, into given vector. This routine is simple a convenient call to all three subroutines, since this is most likely what any engineering model will want to do. The return value is used to normalize the residual when checking for convergence in nonlinear problems. For parallel problems, the returned norm is also summed over all processes. mode Mode of unknown (total, incremental, rate of change). va Determines what vector is assembled. eNorms If non-NULL, squared norms of each internal force will be added to this, split up into dof IDs. Sum of element/node norm (squared) of assembled vector. Definition at line 986 of file engngm.C. References assembleVectorFromBC(), assembleVectorFromDofManagers(), assembleVectorFromElements(), comm, oofem::Domain::giveMaxDofID(), oofem::Domain::giveNumber(), giveParallelContext(), isParallel(), oofem::FloatArray::resize(), and oofem::FloatArray::zero(). Referenced by oofem::NonLinearStatic::assembleIncrementalReferenceLoadVectors(), oofem::DIIDynamic::assembleLoadVector(), oofem::StructuralEngngModel::computeExternalLoadReactionContribution(), oofem::PrescribedGradientBCPeriodic::computeField(), oofem::TransportGradientPeriodic::computeField(), oofem::PrescribedGradient::computeField(), oofem::PrescribedGenStrainShell7::computeField(), oofem::TransportGradientDirichlet::computeField(), oofem::MixedGradientPressureDirichlet::computeFields(), oofem::NlDEIDynamic::computeLoadVector(), oofem::StructuralEngngModel::computeReaction(), oofem::VTKXMLExportModule::exportExternalForces(), oofem::StructuralEngngModel::giveInternalForces(), oofem::NonLinearDynamic::proceedStep(), oofem::DynamicRelaxationSolver::solve(), oofem::StationaryTransportProblem::solveYourselfAt(), oofem::LinearStatic::solveYourselfAt(), oofem::FreeWarping::solveYourselfAt(), oofem::DEIDynamic::solveYourselfAt(), oofem::IncrementalLinearStatic::solveYourselfAt(), oofem::StaticStructural::solveYourselfAt(), oofem::LinearStability::solveYourselfAt(), oofem::StokesFlow::solveYourselfAt(), oofem::TransientTransportProblem::solveYourselfAt(), oofem::SUPG::solveYourselfAt(), oofem::DarcyFlow::updateComponent(), oofem::StationaryTransportProblem::updateComponent(), oofem::TransientTransportProblem::updateComponent(), oofem::StaticStructural::updateComponent(), oofem::StokesFlow::updateComponent(), and oofem::SUPG::updateComponent(). Assembles characteristic vector of required type from boundary conditions. eNorms Norms for each dofid (optional). Definition at line 1071 of file engngm.C. References oofem::FloatArray::assemble(), oofem::VectorAssembler::assembleFromActiveBC(), oofem::FloatArray::assembleSquared(), oofem::IntArray::at(), oofem::FloatArray::clear(), oofem::Element::computeDofTransformationMatrix(), oofem::DofManager::computeM2LTransformation(), oofem::EngngModelTimer::EMTT_NetComputationalStepTimer, oofem::Domain::giveBc(), oofem::Element::giveBoundaryEdgeNodes(), oofem::Element::giveBoundarySurfaceNodes(), oofem::GeneralBoundaryCondition::giveDofIDs(), oofem::Domain::giveDofManager(), oofem::Domain::giveElement(), oofem::DofManager::giveLocationArray(), oofem::Domain::giveNumberOfBoundaryConditions(), oofem::Element::giveRotationMatrix(), oofem::Domain::giveSet(), oofem::GeneralBoundaryCondition::giveSetNumber(), oofem::IntArray::giveSize(), oofem::Element::isActivated(), isElementActivated(), oofem::GeneralBoundaryCondition::isImposed(), oofem::FloatArray::isNotEmpty(), oofem::VectorAssembler::locationFromElement(), oofem::VectorAssembler::locationFromElementNodes(), oofem::EngngModelTimer::pauseTimer(), oofem::EngngModelTimer::resumeTimer(), oofem::FloatArray::rotatedWith(), timer, oofem::VectorAssembler::vectorFromEdgeLoad(), oofem::VectorAssembler::vectorFromLoad(), oofem::VectorAssembler::vectorFromNodeLoad(), and oofem::VectorAssembler::vectorFromSurfaceLoad(). Definition at line 1475 of file engngm.C. References oofem::ContactManager::assembleVectorFromContacts(), oofem::Domain::giveContactManager(), and oofem::Domain::hasContactManager(). Assembles characteristic vector of required type from dofManagers into given vector. Definition at line 1016 of file engngm.C. References oofem::FloatArray::assemble(), oofem::FloatArray::assembleSquared(), oofem::FloatArray::clear(), oofem::DofManager::computeM2LTransformation(), oofem::DofManager_shared, oofem::EngngModelTimer::EMTT_NetComputationalStepTimer, oofem::DofManager::giveCompleteLocationArray(), oofem::DofManager::giveCompleteMasterDofIDArray(), oofem::GeneralBoundaryCondition::giveDofIDs(), oofem::Domain::giveDofManager(), oofem::Domain::giveLoad(), oofem::DofManager::giveLoadArray(), oofem::DofManager::giveLocationArray(), oofem::Domain::giveNumberOfDofManagers(), oofem::DofManager::giveParallelMode(), oofem::DofManager::givePartitionsConnectivitySize(), oofem::IntArray::giveSize(), oofem::FloatArray::isNotEmpty(), oofem::EngngModelTimer::pauseTimer(), oofem::EngngModelTimer::resumeTimer(), oofem::FloatArray::rotatedWith(), timer, oofem::FloatArray::times(), and oofem::VectorAssembler::vectorFromNodeLoad(). Referenced by assembleVector(), oofem::NLTransientTransportProblem::solveYourselfAt(), and oofem::NonStationaryTransportProblem::solveYourselfAt(). Assembles characteristic vector of required type from elements into given vector. Definition at line 1198 of file engngm.C. References oofem::FloatArray::assemble(), oofem::FloatArray::assembleSquared(), oofem::IntArray::at(), oofem::FloatArray::clear(), oofem::Element::computeDofTransformationMatrix(), oofem::Element_remote, oofem::EngngModelTimer::EMTT_NetComputationalStepTimer, exchangeRemoteElementData(), oofem::Element::giveBodyLoadList(), oofem::Element::giveBoundaryEdgeNodes(), oofem::Element::giveBoundaryLoadList(), oofem::Element::giveBoundarySurfaceNodes(), oofem::Domain::giveElement(), oofem::Domain::giveLoad(), oofem::Domain::giveNumberOfElements(), oofem::Element::giveParallelMode(), oofem::Element::giveRotationMatrix(), oofem::IntArray::giveSize(), oofem::Element::isActivated(), isElementActivated(), oofem::IntArray::isEmpty(), oofem::FloatArray::isNotEmpty(), isParallel(), oofem::VectorAssembler::locationFromElement(), oofem::VectorAssembler::locationFromElementNodes(), OOFEM_ERROR, oofem::EngngModelTimer::pauseTimer(), RemoteElementExchangeTag, oofem::EngngModelTimer::resumeTimer(), oofem::FloatArray::rotatedWith(), timer, oofem::VectorAssembler::vectorFromEdgeLoad(), oofem::VectorAssembler::vectorFromElement(), oofem::VectorAssembler::vectorFromLoad(), and oofem::VectorAssembler::vectorFromSurfaceLoad(). Referenced by assembleVector(), oofem::DarcyFlow::solveYourselfAt(), oofem::NLTransientTransportProblem::solveYourselfAt(), oofem::StaticStructural::solveYourselfAt(), oofem::NonStationaryTransportProblem::solveYourselfAt(), and oofem::CBS::solveYourselfAt(). Uses load balancer monitor and load balancer instances to decide if rebalancing is needed (monitor) and to repartition the domain (load balancer). Method is responsible for packing all relevant data (the use of dof dictionaries is assumed to store e-model dof related staff, which can later help in renumbering after rebalancing) and to send/receive all data. Then the local update and renumbering is necessary to get consistent data structure. Definition at line 2035 of file engngm.C. References oofem::LoadBalancer::calculateLoadTransfer(), oofem::LoadBalancerMonitor::decide(), oofem::DofManager_local, oofem::DofManager_shared, oofem::EngngModelTimer::EMTT_LoadBalancingTimer, force_load_rebalance_in_first_step, forceEquationNumbering(), oofem::EngngModelTimer::getUtime(), giveDomain(), giveExportModuleManager(), giveLoadBalancer(), giveLoadBalancerMonitor(), oofem::Domain::giveNumberOfDofManagers(), giveRank(), oofem::ExportModuleManager::initialize(), oofem::TimeStep::isNotTheLastStep(), oofem::TimeStep::isTheFirstStep(), lb, oofem::LoadBalancerMonitor::LBD_RECOVER, lbm, oofem::LoadBalancer::migrateLoad(), OOFEM_LOG_INFO, OOFEM_WARNING, packMigratingData(), oofem::LoadBalancer::printStatistics(), oofem::EngngModelTimer::startTimer(), oofem::EngngModelTimer::stopTimer(), timer, and unpackMigratingData(). Referenced by oofem::StaggeredProblem::solveYourself(), solveYourself(), and oofem::AdaptiveNonLinearStatic::solveYourselfAt(). Allows programmer to test some receiver's internal data, before computation begins. Nonzero if receiver check is o.k. Reimplemented in oofem::CBS, oofem::PFEM, oofem::SUPG, oofem::NonStationaryTransportProblem, oofem::StructuralEngngModel, oofem::TransientTransportProblem, oofem::StokesFlow, oofem::StationaryTransportProblem, oofem::FluidMaterialEvaluator, oofem::StructuralMaterialEvaluator, and oofem::DarcyFlow. Definition at line 995 of file engngm.h. Referenced by oofem::StructuralMaterialEvaluator::checkConsistency(), oofem::StationaryTransportProblem::checkConsistency(), oofem::FluidMaterialEvaluator::checkConsistency(), oofem::StokesFlow::checkConsistency(), oofem::TransientTransportProblem::checkConsistency(), oofem::StructuralEngngModel::checkConsistency(), oofem::NonStationaryTransportProblem::checkConsistency(), oofem::SUPG::checkConsistency(), oofem::PFEM::checkConsistency(), oofem::CBS::checkConsistency(), checkProblemConsistency(), oofem::ParticleTopologyDescription::replaceFEMesh(), oofem::HuertaErrorEstimator::solveRefinedElementProblem(), oofem::HuertaErrorEstimator::solveRefinedPatchProblem(), and oofem::HuertaErrorEstimator::solveRefinedWholeProblem(). Reimplemented in oofem::StaggeredProblem, and oofem::ProblemSequence. Definition at line 1844 of file engngm.C. References checkConsistency(), domainList, OOFEM_LOG_DEBUG, and VERBOSE_PRINTS. Prints the ouput of the solution step (using virtual this->printOutputAtservice) to the stream detemined using this->giveOutputStream() method and calls exportModuleManager to do output. Reimplemented in oofem::StaggeredProblem, oofem::StokesFlow, oofem::LinearStability, oofem::FluidMaterialEvaluator, oofem::EigenValueDynamic, and oofem::StructuralMaterialEvaluator. Definition at line 670 of file engngm.C. References oofem::ExportModuleManager::doOutput(), exportModuleManager, giveOutputStream(), printOutputAt(), and suppressOutput. Referenced by oofem::StokesFlow::doStepOutput(), oofem::NonLinearStatic::terminate(), and terminate(). Definition at line 1920 of file engngm.C. References oofem::oofegGraphicContext::getActiveDomain(), giveCurrentStep(), giveDomain(), and oofem::Domain::giveElements(). Referenced by oofem::StaggeredProblem::drawElements(), and drawYourself(). Definition at line 1929 of file engngm.C. References oofem::oofegGraphicContext::getActiveDomain(), giveCurrentStep(), oofem::Domain::giveDofManagers(), and giveDomain(). Referenced by oofem::StaggeredProblem::drawNodes(), and drawYourself(). Definition at line 1908 of file engngm.C. References drawElements(), drawNodes(), oofem::oofegGraphicContext::giveIntVarPlotMode(), oofem::OGC_essentialBC, oofem::OGC_naturalBC, oofem::OGC_nodeAnnotation, oofem::OGC_nodeGeometry, oofem::OGC_nodeScalarPlot, and oofem::OGC_nodeVectorPlot. Returns string for prepending output (used by error reporting macros). Definition at line 1710 of file engngm.C. References giveClassName(), isParallel(), and rank. Determines the space necessary for send/receive buffer. It uses related communication map pattern to determine the maximum size needed. commMap Communication map used to send/receive messages. packUnpackType Determines the type of packed quantity, used by receiver to estimate the size of pack/unpack buffer accordingly. Upper bound of space needed. Reimplemented in oofem::NlDEIDynamic, oofem::NonLinearStatic, oofem::NonLinearDynamic, oofem::StaticStructural, oofem::FreeWarping, and oofem::LinearStatic. Definition at line 1099 of file engngm.h. Exchanges necessary remote element data with remote partitions. The receiver's nonlocalExt flag must be set. Uses receiver nonlocCommunicator to perform the task using packRemoteElementData and unpackRemoteElementData receiver's services. ExchangeTag Exchange tag used by communicator. Definition at line 1996 of file engngm.C. References oofem::Communicator::finishExchange(), giveRank(), oofem::Communicator::initExchange(), isParallel(), nonlocalExt, nonlocCommunicator, OOFEM_ERROR, oofem::Communicator::packAllData(), packRemoteElementData(), oofem::Communicator::unpackAllData(), unpackRemoteElementData(), and VERBOSEPARALLEL_PRINT. Referenced by oofem::AdaptiveNonLinearStatic::adaptiveRemap(), and assembleVectorFromElements(). Forces equation renumbering on given domain. All equation numbers in all dofManagers are invalidated, and new equation numbers are generated starting from domainNeqs entry corresponding to given domain. It will update numberOfEquations variable accordingly. Should be used at startup to force equation numbering and therefore sets numberOfEquations. Must be used if model supports changes of static system to assign new valid equation numbers to dofManagers. Reimplemented in oofem::PFEM, oofem::StokesFlow, oofem::DarcyFlow, and oofem::FluidModel. Definition at line 408 of file engngm.C. References oofem::SloanGraph::askNewOptimalNumbering(), oofem::IntArray::at(), domainNeqs, domainPrescribedNeqs, oofem::Timer::getUtime(), oofem::Domain::giveBcs(), giveCurrentStep(), oofem::Domain::giveDofManagers(), giveDomain(), oofem::Domain::giveElements(), oofem::SloanGraph::giveOptimalProfileSize(), oofem::SloanGraph::initialize(), OOFEM_LOG_DEBUG, OOFEM_LOG_INFO, profileOpt, oofem::Timer::startTimer(), oofem::Timer::stopTimer(), timer, and oofem::SloanGraph::tryParameters(). Referenced by oofem::XfemSolverInterface::propagateXfemInterfaces(), and oofem::ParticleTopologyDescription::replaceFEMesh(). All equation numbers in all domains for all dofManagers are invalidated, and new equation numbers are generated starting from 1 on each domain. It will update numberOfEquations variable accordingly. Should be used at startup to force equation numbering and therefore sets numberOfEquations. Must be used if model supports changes of static system to assign new valid equation numbers to dofManagers. Reimplemented in oofem::StaggeredProblem, oofem::TransientTransportProblem, oofem::StaticStructural, and oofem::FluidModel. Definition at line 473 of file engngm.C. References oofem::IntArray::at(), domainNeqs, domainPrescribedNeqs, equationNumberingCompleted, giveNumberOfDomains(), numberOfEquations, numberOfPrescribedEquations, OOFEM_LOG_DEBUG, and parallelContextList. Referenced by oofem::AdaptiveNonLinearStatic::adaptiveRemap(), balanceLoad(), oofem::FluidModel::forceEquationNumbering(), oofem::DarcyFlow::forceEquationNumbering(), oofem::StaticStructural::forceEquationNumbering(), oofem::TransientTransportProblem::forceEquationNumbering(), oofem::DarcyFlow::giveFormulation(), oofem::PFEM::giveNextStep(), oofem::PFEM::giveNumberOfDomainEquations(), giveNumberOfDomainEquations(), solveYourself(), and oofem::IncrementalLinearStatic::solveYourselfAt(). Generate new time step (and associate metastep). The advantage of this method is that the associated metasteps are generated on the fly, which is not the case of giveNextStep method, which should only be called from solveYoursef, as it generate metasteps. This method in general allows to get external processing of individual solution steps (using solveYourselfAt) from outside, othervise the only way how to generate valid sequence is solveYorself method, but it method does not allow to get processing for individual steps. Definition at line 559 of file engngm.C. References currentStep, giveMetaStep(), giveNextStep(), oofem::MetaStep::giveNumberOfSteps(), oofem::MetaStep::giveStepRelativeNumber(), initMetaStepAttributes(), nMetaSteps, and preInitializeNextStep(). Returns the real and user time for the analysis. Definition at line 1808 of file engngm.C. References oofem::EngngModelTimer::convert2HMS(), oofem::EngngModelTimer::EMTT_AnalysisTimer, oofem::EngngModelTimer::getUtime(), oofem::EngngModelTimer::getWtime(), and timer. Referenced by oofem::OutputExportModule::terminate(), and terminateAnalysis(). Implemented in oofem::CBS, oofem::PFEM, oofem::StaggeredProblem, oofem::SUPG, oofem::NonLinearStatic, oofem::NonStationaryTransportProblem, oofem::NlDEIDynamic, oofem::NonLinearDynamic, oofem::QClinearStatic, oofem::AdaptiveNonLinearStatic, oofem::TransientTransportProblem, oofem::LinearStability, oofem::StaticStructural, oofem::StokesFlow, oofem::IncrementalLinearStatic, oofem::DIIDynamic, oofem::FreeWarping, oofem::EigenValueDynamic, oofem::LinearStatic, oofem::DEIDynamic, oofem::StationaryTransportProblem, oofem::FluidMaterialEvaluator, oofem::FluidStructureProblem, oofem::StructuralMaterialEvaluator, oofem::ProblemSequence, oofem::NLTransientTransportProblem, oofem::AdaptiveLinearStatic, oofem::DarcyFlow, and oofem::StokesFlowVelocityHomogenization. Referenced by errorInfo(), and printYourself(). Definition at line 1078 of file engngm.h. Referenced by oofem::TransportElement::computeBoundaryEdgeLoadVector(), oofem::TransportElement::computeBoundarySurfaceLoadVector(), oofem::TransportElement::computeEdgeBCSubVectorAt(), oofem::B3Material::computeShrinkageStrainVector(), oofem::StructuralMaterial::computeStressIndependentStrainVector(), oofem::StructuralMaterial::computeStressIndependentStrainVector_3d(), oofem::TransportElement::computeSurfaceBCSubVectorAt(), oofem::LEPlic::doLagrangianPhase(), EngngModel(), oofem::B3SolidMaterial::giveHumidity(), oofem::MPSMaterial::giveHumidity(), oofem::B3SolidMaterial::giveHumidityIncrement(), oofem::StructuralMaterial::giveIPValue(), oofem::MisesMat::giveTemperature(), oofem::MPSMaterial::giveTemperature(), oofem::SimpleCrossSection::giveTemperatureVector(), oofem::StationaryTransportProblem::initializeFrom(), oofem::TransientTransportProblem::initializeFrom(), oofem::SUPG::initializeFrom(), and oofem::CBS::initializeFrom(). Returns the filename for the context file for the given step and version. tStepNumber Solution step number to store/restore. Definition at line 1691 of file engngm.C. Referenced by oofem::HuertaErrorEstimator::estimateError(), oofem::AdaptiveNonLinearStatic::initializeAdaptive(), and saveStepContext(). Returns domain context output mode. Definition at line 379 of file engngm.h. Returns domain context output step. Definition at line 383 of file engngm.h. Definition at line 1684 of file engngm.C. Referenced by oofem::AdaptiveNonLinearStatic::adaptiveRemap(), oofem::MacroLSpace::computeStiffnessMatrix(), oofem::AdaptiveNonLinearStatic::initializeAdaptiveFrom(), oofem::NonLinearDynamic::proceedStep(), restoreContext(), oofem::MicroMaterial::setMacroProperties(), oofem::LinearStability::solveYourself(), oofem::DarcyFlow::solveYourselfAt(), oofem::NLTransientTransportProblem::solveYourselfAt(), oofem::StationaryTransportProblem::solveYourselfAt(), oofem::IncrementalLinearStatic::solveYourselfAt(), oofem::StokesFlow::solveYourselfAt(), oofem::TransientTransportProblem::solveYourselfAt(), oofem::NonStationaryTransportProblem::solveYourselfAt(), oofem::SUPG::solveYourselfAt(), oofem::CBS::solveYourselfAt(), oofem::StationaryTransportProblem::updateDomainLinks(), oofem::LinearStatic::updateDomainLinks(), oofem::FreeWarping::updateDomainLinks(), oofem::StaticStructural::updateDomainLinks(), oofem::TransientTransportProblem::updateDomainLinks(), oofem::NonLinearDynamic::updateDomainLinks(), oofem::NonStationaryTransportProblem::updateDomainLinks(), oofem::NonLinearStatic::updateDomainLinks(), oofem::SUPG::updateDomainLinks(), and oofem::CBS::updateDomainLinks(). Returns number of iterations that was required to reach equilibrium - used for adaptive step length in staggered problem. Reimplemented in oofem::NonLinearStatic, and oofem::NLTransientTransportProblem. Definition at line 545 of file engngm.h. Definition at line 683 of file engngm.h. Referenced by oofem::AdaptiveNonLinearStatic::adaptiveRemap(), oofem::NLTransientTransportProblem::assembleAlgorithmicPartOfRhs(), oofem::LIBeam3d2::computeBmatrixAt(), oofem::Beam2d::computeBmatrixAt(), oofem::Beam3d::computeBmatrixAt(), oofem::FE2FluidMaterial::computeDeviatoricStressVector(), oofem::TransportGradientNeumann::computeEta(), oofem::NonLinearStatic::computeExternalLoadReactionContribution(), oofem::LIBeam3d2::computeGtoLRotationMatrix(), oofem::Beam2d::computeNmatrixAt(), oofem::Beam3d::computeNmatrixAt(), oofem::MacroLSpace::computeStiffnessMatrix(), oofem::TransportGradientDirichlet::computeXi(), oofem::PrescribedGradientBCWeak::damageExceedsTolerance(), oofem::DIIDynamic::determineConstants(), drawElements(), drawNodes(), oofem::PFEMParticle::drawScalar(), oofem::TR1_2D_PFEM::drawScalar(), oofem::HuertaErrorEstimator::estimateError(), oofem::FluidModel::forceEquationNumbering(), forceEquationNumbering(), giveCurrentMetaStep(), oofem::StaggeredProblem::giveCurrentStep(), giveCurrentStep(), oofem::StationaryTransportProblem::giveField(), oofem::TransientTransportProblem::giveField(), oofem::RVEStokesFlow::giveFluxVector(), oofem::MacroLSpace::giveInternalForcesVector(), oofem::NLTransientTransportProblem::giveUnknownComponent(), oofem::LinearStatic::giveUnknownComponent(), oofem::FreeWarping::giveUnknownComponent(), oofem::DEIDynamic::giveUnknownComponent(), oofem::DIIDynamic::giveUnknownComponent(), oofem::AdaptiveNonLinearStatic::giveUnknownComponent(), oofem::NonLinearDynamic::giveUnknownComponent(), oofem::NlDEIDynamic::giveUnknownComponent(), oofem::NonLinearStatic::giveUnknownComponent(), oofem::NLTransientTransportProblem::giveUnknownDictHashIndx(), oofem::SUPG::giveUnknownDictHashIndx(), oofem::IsotropicDamageMaterial1::initDamaged(), oofem::AdaptiveNonLinearStatic::initializeAdaptiveFrom(), oofem::TimeStep::isTheCurrentTimeStep(), oofem::GnuplotExportModule::outputBoundaryCondition(), oofem::GnuplotExportModule::outputInterfaceEl(), oofem::GnuplotExportModule::outputMesh(), oofem::GnuplotExportModule::outputXFEM(), oofem::GnuplotExportModule::outputXFEMGeometry(), packRemoteElementData(), oofem::Subdivision::packRemoteElements(), oofem::GeometryBasedEI::propagateFronts(), oofem::PLMaterialForce::propagateInterface(), oofem::HuertaErrorEstimator::saveContext(), saveContext(), saveStepContext(), oofem::EigenValueDynamic::setActiveVector(), oofem::LinearStability::setActiveVector(), oofem::PatchIntegrationRule::SetUpPointsOnTriangle(), oofem::PatchIntegrationRule::SetUpPointsOnWedge(), oofem::HuertaErrorEstimator::setupRefinedProblemEpilog2(), oofem::HuertaErrorEstimator::setupRefinedProblemProlog(), oofem::HuertaErrorEstimator::solveRefinedElementProblem(), oofem::HuertaErrorEstimator::solveRefinedPatchProblem(), oofem::HuertaErrorEstimator::solveRefinedWholeProblem(), oofem::LinearStability::solveYourself(), oofem::StaggeredProblem::solveYourself(), solveYourself(), oofem::LinearStability::solveYourselfAt(), oofem::AdaptiveNonLinearStatic::solveYourselfAt(), oofem::SUPG::solveYourselfAt(), oofem::CBS::solveYourselfAt(), unpackRemoteElementData(), oofem::MacroLSpace::updateYourself(), oofem::GeometryBasedEI::writeVtkDebug(), and oofem::XfemStructuralElementInterface::XfemElementInterface_updateIntegrationRule(). Definition at line 344 of file engngm.h. Generates error if no such domain is defined. n Pointer to n-th domain is returned. Definition at line 1720 of file engngm.C. Referenced by oofem::PrimaryField::__evaluateAt(), oofem::AdaptiveNonLinearStatic::adaptiveRemap(), oofem::DofDistributedPrimaryField::advanceSolution(), oofem::DofDistributedPrimaryField::applyBoundaryCondition(), oofem::PrimaryField::applyBoundaryCondition(), oofem::NRSolver::applyConstraintsToLoadIncrement(), oofem::DofDistributedPrimaryField::applyDefaultInitialCondition(), oofem::PrimaryField::applyDefaultInitialCondition(), oofem::NLTransientTransportProblem::applyIC(), oofem::TransientTransportProblem::applyIC(), oofem::SUPG::applyIC(), oofem::NonStationaryTransportProblem::applyIC(), oofem::CBS::applyIC(), oofem::StokesFlowVelocityHomogenization::applyPressureGradient(), oofem::NLTransientTransportProblem::assembleAlgorithmicPartOfRhs(), oofem::NonStationaryTransportProblem::assembleAlgorithmicPartOfRhs(), oofem::NonStationaryTransportProblem::assembleDirichletBcRhsVector(), oofem::AdaptiveNonLinearStatic::assembleInitialLoadVector(), balanceLoad(), oofem::SkylineUnsym::buildInternalStructure(), oofem::PetscSparseMtrx::buildInternalStructure(), oofem::DynCompRow::buildInternalStructure(), oofem::DynCompCol::buildInternalStructure(), oofem::Skyline::buildInternalStructure(), oofem::SymCompCol::buildInternalStructure(), oofem::CompCol::buildInternalStructure(), oofem::StructuralEngngModel::buildReactionTable(), oofem::StructuralMaterialEvaluator::checkConsistency(), oofem::StationaryTransportProblem::checkConsistency(), oofem::FluidMaterialEvaluator::checkConsistency(), oofem::StokesFlow::checkConsistency(), oofem::TransientTransportProblem::checkConsistency(), oofem::StructuralEngngModel::checkConsistency(), oofem::NonStationaryTransportProblem::checkConsistency(), oofem::SUPG::checkConsistency(), oofem::CBS::checkConsistency(), oofem::MatlabExportModule::computeArea(), oofem::SolutionbasedShapeFunction::computeBaseFunctionValueAt(), oofem::FreeWarping::computeCenterOfGravity(), oofem::SolutionbasedShapeFunction::computeCorrectionFactors(), oofem::StructuralEngngModel::computeExternalLoadReactionContribution(), oofem::NlDEIDynamic::computeLoadVector(), oofem::NlDEIDynamic::computeMassMtrx(), oofem::StructuralEngngModel::computeReaction(), oofem::FreeWarping::computeResultAtCenterOfGravity(), oofem::StokesFlowVelocityHomogenization::computeSeepage(), oofem::MacroLSpace::computeStiffnessMatrix(), oofem::StokesFlowVelocityHomogenization::computeTangent(), oofem::InteractionLoad::computeValueAt(), oofem::SolutionbasedShapeFunction::copyDofManagersToSurfaceData(), oofem::StructuralFE2MaterialStatus::copyStateVariables(), oofem::NonStationaryTransportProblem::copyUnknownsInDictionary(), oofem::QClinearStatic::createInterpolationMeshNodes(), oofem::ProblemCommunicator::DofManCmp(), oofem::GPInitModule::doInit(), oofem::CrackExportModule::doOutput(), oofem::DofManExportModule::doOutput(), oofem::GPExportModule::doOutput(), oofem::HOMExportModule::doOutput(), oofem::GnuplotExportModule::doOutput(), oofem::VTKExportModule::doOutput(), oofem::MatlabExportModule::doOutput(), oofem::VTKXMLExportModule::doOutput(), oofem::ErrorCheckingExportModule::doOutput(), oofem::MatlabExportModule::doOutputData(), oofem::MatlabExportModule::doOutputHomogenizeDofIDs(), oofem::MatlabExportModule::doOutputIntegrationPointFields(), oofem::MatlabExportModule::doOutputMesh(), oofem::MatlabExportModule::doOutputReactionForces(), oofem::MatlabExportModule::doOutputSpecials(), oofem::StructuralMaterialEvaluator::doStepOutput(), oofem::FluidMaterialEvaluator::doStepOutput(), oofem::LinearStability::doStepOutput(), oofem::StokesFlow::doStepOutput(), drawElements(), drawNodes(), oofem::ProblemCommunicator::ElemCmp(), oofem::LinearStatic::estimateMaxPackSize(), oofem::FreeWarping::estimateMaxPackSize(), oofem::StaticStructural::estimateMaxPackSize(), oofem::NonLinearDynamic::estimateMaxPackSize(), oofem::NonLinearStatic::estimateMaxPackSize(), oofem::NlDEIDynamic::estimateMaxPackSize(), oofem::SUPG::evaluateElementStabilizationCoeffs(), oofem::VTKExportModule::exportCellVars(), oofem::VTKXMLExportModule::exportCellVars(), oofem::VTKXMLExportModule::exportExternalForces(), oofem::POIExportModule::exportIntVarAs(), oofem::VTKExportModule::exportIntVarAs(), oofem::VTKXMLExportModule::exportIntVars(), oofem::VTKXMLExportModule::exportIntVarsInGpAs(), oofem::POIExportModule::exportPrimaryVars(), oofem::VTKXMLExportModule::exportPrimaryVars(), oofem::POIExportModule::exportPrimVarAs(), oofem::VTKExportModule::exportPrimVarAs(), oofem::FluidModel::forceEquationNumbering(), forceEquationNumbering(), oofem::QClinearStatic::generateInterpolationMesh(), oofem::VTKXMLExportModule::getNodalVariableFromXFEMST(), oofem::StokesFlowVelocityHomogenization::giveAreaOfRVE(), oofem::InteractionPFEMParticle::giveCoupledVelocities(), oofem::TransientTransportProblem::giveDeltaT(), oofem::NonStationaryTransportProblem::giveDtFunction(), oofem::StaggeredProblem::giveDtFunction(), oofem::StructuralEngngModel::giveInternalForces(), oofem::AdaptiveNonLinearStatic::giveLoadBalancer(), oofem::NonLinearDynamic::giveLoadBalancer(), oofem::NonLinearStatic::giveLoadBalancer(), oofem::MicroMaterial::giveMacroStiffnessMatrix(), oofem::SUPG::giveNextStep(), oofem::CBS::giveNextStep(), oofem::DarcyFlow::giveNumericalMethod(), oofem::StationaryTransportProblem::giveNumericalMethod(), oofem::StaticStructural::giveNumericalMethod(), oofem::TransientTransportProblem::giveNumericalMethod(), oofem::StokesFlow::giveNumericalMethod(), oofem::NonLinearDynamic::giveNumericalMethod(), oofem::NlDEIDynamic::giveNumericalMethod(), oofem::NonLinearStatic::giveNumericalMethod(), oofem::InteractionPFEMParticle::givePrescribedUnknownVector(), oofem::VTKXMLExportModule::givePrimVarSmoother(), oofem::StructuralFE2Material::giveRealStressVector_3d(), oofem::ExportModule::giveRegionSet(), oofem::VTKExportModule::giveSmoother(), oofem::VTKXMLExportModule::giveSmoother(), oofem::SolutionbasedShapeFunction::giveValueAtPoint(), oofem::Natural2GlobalOrdering::init(), oofem::Natural2LocalOrdering::init(), oofem::oofegGraphicContext::init(), oofem::DofDistributedPrimaryField::initialize(), oofem::AdaptiveNonLinearStatic::initializeAdaptive(), oofem::AdaptiveNonLinearStatic::initializeAdaptiveFrom(), oofem::ExportModule::initializeElementSet(), oofem::SUPG::initializeFrom(), oofem::CBS::initializeFrom(), initializeFrom(), oofem::SolutionbasedShapeFunction::initializeSurfaceData(), oofem::DIIDynamic::initializeYourself(), oofem::NonLinearDynamic::initializeYourself(), oofem::StokesFlowVelocityHomogenization::integrateNMatrix(), oofem::QClinearStatic::loadInterpolationMesh(), oofem::GnuplotExportModule::outputReactionForces(), oofem::GnuplotExportModule::outputXFEM(), packDofManagers(), oofem::NonLinearDynamic::packMigratingData(), oofem::NonLinearStatic::packMigratingData(), packRemoteElementData(), oofem::QClinearStatic::postInitialize(), oofem::AdaptiveLinearStatic::printOutputAt(), oofem::EigenValueDynamic::printOutputAt(), oofem::FreeWarping::printOutputAt(), oofem::LinearStability::printOutputAt(), oofem::NonLinearDynamic::printOutputAt(), oofem::StructuralEngngModel::printOutputAt(), oofem::NonLinearStatic::printOutputAt(), oofem::NlDEIDynamic::printOutputAt(), oofem::StructuralEngngModel::printReactionForces(), oofem::NonLinearDynamic::proceedStep(), oofem::NonLinearStatic::proceedStep(), oofem::XfemSolverInterface::propagateXfemInterfaces(), oofem::PrimaryField::readFromDofDictionaries(), oofem::StaticStructural::requiresEquationRenumbering(), oofem::TransientTransportProblem::requiresEquationRenumbering(), oofem::oofegGraphicContext::setActiveProblem(), oofem::SolutionbasedShapeFunction::setLoads(), oofem::MicroMaterial::setMacroProperties(), oofem::FETICommunicator::setUpCommunicationMaps(), oofem::NodeCommunicator::setUpCommunicationMaps(), oofem::ElementCommunicator::setUpCommunicationMaps(), oofem::QuasicontinuumVTKXMLExportModule::setupVTKPiece(), oofem::VTKXMLExportModule::setupVTKPiece(), oofem::NonLinearDynamic::showSparseMtrxStructure(), oofem::NonLinearStatic::showSparseMtrxStructure(), oofem::StructuralEngngModel::showSparseMtrxStructure(), oofem::HuertaErrorEstimator::solveRefinedElementProblem(), oofem::HuertaErrorEstimator::solveRefinedPatchProblem(), oofem::HuertaErrorEstimator::solveRefinedWholeProblem(), oofem::StructuralMaterialEvaluator::solveYourself(), oofem::FluidMaterialEvaluator::solveYourself(), oofem::DarcyFlow::solveYourselfAt(), oofem::NLTransientTransportProblem::solveYourselfAt(), oofem::StationaryTransportProblem::solveYourselfAt(), oofem::LinearStatic::solveYourselfAt(), oofem::FluidStructureProblem::solveYourselfAt(), oofem::FreeWarping::solveYourselfAt(), oofem::DEIDynamic::solveYourselfAt(), oofem::IncrementalLinearStatic::solveYourselfAt(), oofem::EigenValueDynamic::solveYourselfAt(), oofem::StaticStructural::solveYourselfAt(), oofem::StokesFlow::solveYourselfAt(), oofem::TransientTransportProblem::solveYourselfAt(), oofem::LinearStability::solveYourselfAt(), oofem::AdaptiveNonLinearStatic::solveYourselfAt(), oofem::DIIDynamic::solveYourselfAt(), oofem::QClinearStatic::solveYourselfAt(), oofem::NlDEIDynamic::solveYourselfAt(), oofem::NonStationaryTransportProblem::solveYourselfAt(), oofem::SUPG::solveYourselfAt(), oofem::CBS::solveYourselfAt(), oofem::PrimaryField::storeInDofDictionaries(), oofem::LinearStability::terminateLinStatic(), unpackDofManagers(), oofem::NonLinearDynamic::unpackMigratingData(), oofem::NonLinearStatic::unpackMigratingData(), unpackRemoteElementData(), oofem::DofDistributedPrimaryField::update(), oofem::DarcyFlow::updateComponent(), oofem::StationaryTransportProblem::updateComponent(), oofem::NonLinearDynamic::updateComponent(), oofem::FreeWarping::updateComputedResults(), oofem::SUPG::updateDofUnknownsDictionary_corrector(), oofem::SUPG::updateDofUnknownsDictionary_predictor(), oofem::AdaptiveLinearStatic::updateDomainLinks(), oofem::StationaryTransportProblem::updateDomainLinks(), oofem::LinearStatic::updateDomainLinks(), oofem::FreeWarping::updateDomainLinks(), oofem::StaticStructural::updateDomainLinks(), oofem::TransientTransportProblem::updateDomainLinks(), oofem::AdaptiveNonLinearStatic::updateDomainLinks(), oofem::NonLinearDynamic::updateDomainLinks(), oofem::NonStationaryTransportProblem::updateDomainLinks(), oofem::NonLinearStatic::updateDomainLinks(), oofem::CBS::updateDomainLinks(), oofem::SUPG::updateElementsForNewInterfacePosition(), oofem::SUPG::updateSolutionVectors(), oofem::SUPG::updateSolutionVectors_predictor(), oofem::FreeWarping::updateStiffnessMatrix(), oofem::AdaptiveLinearStatic::updateYourself(), oofem::VTKXMLExportModule::writeVTKPiece(), and oofem::VTKXMLExportModule::writeXFEMVars(). Service for accessing ErrorEstimator corresponding to particular domain. Definition at line 349 of file engngm.h. Referenced by oofem::Domain::giveErrorEstimator(), oofem::NonLinearDynamic::unpackMigratingData(), and oofem::NonLinearStatic::unpackMigratingData(). Definition at line 1701 of file engngm.C. Referenced by oofem::AdaptiveNonLinearStatic::initializeAdaptive(), and oofem::Domain::restoreContext(). Only relevant for eigen value analysis. Otherwise returns zero. Reimplemented in oofem::LinearStability, and oofem::EigenValueDynamic. Definition at line 522 of file engngm.h. Reimplemented in oofem::IncrementalLinearStatic, and oofem::StaticStructural. Definition at line 752 of file engngm.h. Returns reference to itself -> required by communicator.h. Definition at line 1117 of file engngm.h. Returns the Equation scaling flag, which is used to indicate that governing equation(s) are scaled, or non-dimensionalized. Reimplemented in oofem::CBS, and oofem::SUPG. Definition at line 1085 of file engngm.h. Referenced by oofem::NewtonianFluidMaterial::checkConsistency(), oofem::NonlinearFluidMaterial::checkConsistency(), oofem::BinghamFluidMaterial2::checkConsistency(), and oofem::Node::initializeFrom(). Returns receiver's export module manager. Definition at line 758 of file engngm.h. Referenced by balanceLoad(), oofem::NRSolver::solve(), oofem::CylindricalALM::solve(), oofem::StokesFlow::solveYourselfAt(), and updateDomainLinks(). Returns the smart pointer to requested field, Null otherwise. The return value uses shared_ptr, as some registered fields may be owned (and maintained) by emodel, while some may be created on demand and thus reliable reference counting mechanism is essential. Reimplemented in oofem::TransientTransportProblem, and oofem::StationaryTransportProblem. Definition at line 512 of file engngm.h. This is used for example on Nodal level to update coordinates if updated formulation is done, or on element level, when non linear contributions are computed. Reimplemented in oofem::CBS, oofem::PFEM, oofem::StaggeredProblem, oofem::SUPG, oofem::NonLinearStatic, oofem::NonStationaryTransportProblem, oofem::NlDEIDynamic, oofem::NonLinearDynamic, oofem::QClinearStatic, oofem::TransientTransportProblem, oofem::LinearStability, oofem::IncrementalLinearStatic, oofem::DIIDynamic, oofem::StaticStructural, oofem::FreeWarping, oofem::LinearStatic, oofem::DEIDynamic, oofem::FluidStructureProblem, oofem::StationaryTransportProblem, oofem::NLTransientTransportProblem, and oofem::DarcyFlow. Definition at line 1069 of file engngm.h. Referenced by oofem::NLStructuralElement::computeStiffnessMatrix(), oofem::GradDpElement::computeStiffnessMatrix_ku(), oofem::GradDpElement::computeStiffnessMatrix_uk(), oofem::GradDpElement::computeStiffnessMatrix_uu(), oofem::NLStructuralElement::computeStiffnessMatrix_withIRulesAsSubcells(), oofem::GradDpElement::computeStressVectorAndLocalCumulatedStrain(), oofem::GradDpElement::giveInternalForcesVector(), oofem::NLStructuralElement::giveInternalForcesVector(), oofem::NLStructuralElement::giveInternalForcesVector_withIRulesAsSubcells(), oofem::GradDpElement::giveLocalInternalForcesVector(), oofem::PhaseFieldElement::initializeFrom(), and oofem::Node::updateYourself(). Returns reference to receiver's load balancer. Reimplemented in oofem::NonLinearStatic, oofem::NonLinearDynamic, and oofem::AdaptiveNonLinearStatic. Definition at line 1110 of file engngm.h. Referenced by balanceLoad(), oofem::WallClockLoadBalancerMonitor::decide(), and updateAttributes(). Returns reference to receiver's load balancer monitor. Definition at line 1112 of file engngm.h. Referenced by balanceLoad(), oofem::ParmetisLoadBalancer::calculateLoadTransfer(), and updateAttributes(). Returns the current load level. Reimplemented in oofem::NonLinearStatic, and oofem::StaticStructural. Definition at line 519 of file engngm.h. Definition at line 516 of file engngm.h. Referenced by oofem::LatticeTransportMaterial::computeConductivity(), oofem::InteractionLoad::computeValueAt(), oofem::InteractionPFEMParticle::giveFluidStructureMasterProblem(), and oofem::LatticeDamage2d::giveRealStressVector(). Definition at line 351 of file engngm.h. Referenced by oofem::VTKExportModule::exportIntVarAs(), oofem::VTKXMLExportModule::getNodalVariableFromIS(), oofem::Quad10_2D_SUPG::giveIPValue(), oofem::TR1_2D_SUPG::giveIPValue(), and oofem::TwoFluidMaterial::giveTempVOF(). Definition at line 1765 of file engngm.C. References metaStepList, nMetaSteps, and OOFEM_ERROR. Referenced by oofem::AdaptiveNonLinearStatic::assembleInitialLoadVector(), generateNextStep(), giveCurrentMetaStep(), oofem::NonLinearDynamic::giveNextStep(), oofem::NonLinearStatic::giveNextStep(), oofem::NonLinearStatic::proceedStep(), restoreContext(), saveContext(), oofem::MicroMaterial::setMacroProperties(), oofem::HuertaErrorEstimator::setupRefinedProblemProlog(), oofem::StaggeredProblem::solveYourself(), solveYourself(), oofem::LinearStatic::solveYourselfAt(), oofem::FreeWarping::solveYourselfAt(), oofem::EigenValueDynamic::solveYourselfAt(), oofem::LinearStability::solveYourselfAt(), oofem::StaticStructural::updateAttributes(), oofem::NonLinearStatic::updateAttributes(), updateAttributes(), oofem::NonLinearStatic::updateComponent(), and oofem::NonLinearStatic::updateLoadVectors(). Increases number of equations of receiver's domain and returns newly created equation number. Used mainly by DofManagers to allocate their corresponding equation number if it is not currently allocated. The DofIDItem parameter allows to distinguish between several possible governing equations, that can be numbered separately. Reimplemented in oofem::PFEM, and oofem::CBS. Definition at line 769 of file engngm.h. Referenced by oofem::ActiveDof::askNewEquationNumber(), and oofem::MasterDof::askNewEquationNumber(). Increases number of prescribed equations of receiver's domain and returns newly created equation number. Definition at line 777 of file engngm.h. Reimplemented in oofem::CBS, oofem::PFEM, oofem::StaggeredProblem, oofem::SUPG, oofem::NonLinearStatic, oofem::NonStationaryTransportProblem, oofem::NlDEIDynamic, oofem::NonLinearDynamic, oofem::StokesFlow, oofem::LinearStability, oofem::TransientTransportProblem, oofem::DIIDynamic, oofem::StaticStructural, oofem::EigenValueDynamic, oofem::FreeWarping, oofem::FluidMaterialEvaluator, oofem::IncrementalLinearStatic, oofem::DEIDynamic, oofem::LinearStatic, oofem::StructuralMaterialEvaluator, oofem::StationaryTransportProblem, oofem::NLTransientTransportProblem, and oofem::DarcyFlow. Definition at line 701 of file engngm.h. Referenced by generateNextStep(), oofem::MicroMaterial::setMacroProperties(), oofem::StaggeredProblem::solveYourself(), solveYourself(), and oofem::MacroLSpace::updateYourself(). Returns number of equations for given domain in active (current time step) time step. The numbering scheme determines which system the result is requested for. Definition at line 391 of file engngm.C. References oofem::IntArray::at(), domainNeqs, domainPrescribedNeqs, equationNumberingCompleted, forceEquationNumbering(), and oofem::UnknownNumberingScheme::isDefault(). Referenced by oofem::AdaptiveNonLinearStatic::adaptiveRemap(), oofem::PrimaryField::applyDefaultInitialCondition(), oofem::SUPG::applyIC(), oofem::NonStationaryTransportProblem::applyIC(), oofem::DIIDynamic::assembleDirichletBcRhsVector(), assembleExtrapolatedForces(), oofem::NonLinearStatic::assembleIncrementalReferenceLoadVectors(), oofem::AdaptiveNonLinearStatic::assembleInitialLoadVector(), oofem::DIIDynamic::assembleLoadVector(), assemblePrescribedExtrapolatedForces(), oofem::SkylineUnsym::buildInternalStructure(), oofem::SpoolesSparseMtrx::buildInternalStructure(), oofem::PetscSparseMtrx::buildInternalStructure(), oofem::DynCompRow::buildInternalStructure(), oofem::DynCompCol::buildInternalStructure(), oofem::Skyline::buildInternalStructure(), oofem::SymCompCol::buildInternalStructure(), oofem::CompCol::buildInternalStructure(), oofem::StructuralEngngModel::buildReactionTable(), oofem::TransportGradientDirichlet::computeCoefficientMatrix(), oofem::StructuralEngngModel::computeExternalLoadReactionContribution(), oofem::PrescribedGradient::computeField(), oofem::PrescribedGenStrainShell7::computeField(), oofem::TransportGradientDirichlet::computeField(), oofem::MixedGradientPressureDirichlet::computeFields(), oofem::NlDEIDynamic::computeLoadVector(), oofem::NlDEIDynamic::computeMassMtrx(), oofem::StructuralEngngModel::computeReaction(), oofem::StokesFlowVelocityHomogenization::computeTangent(), oofem::DarcyFlow::DumpMatricesToFile(), oofem::PrescribedGenStrainShell7::evaluateHigherOrderContribution(), oofem::VTKXMLExportModule::exportExternalForces(), oofem::StructuralEngngModel::giveInternalForces(), oofem::ParallelContext::giveNumberOfGlobalEqs(), oofem::ParallelContext::giveNumberOfLocalEqs(), oofem::ParallelContext::giveNumberOfNaturalEqs(), oofem::Natural2GlobalOrdering::init(), oofem::Natural2LocalOrdering::init(), oofem::DofDistributedPrimaryField::initialize(), oofem::AdaptiveNonLinearStatic::initializeAdaptiveFrom(), oofem::DIIDynamic::initializeYourself(), oofem::NonLinearDynamic::initializeYourself(), oofem::EIPrimaryUnknownMapper::mapAndUpdate(), oofem::LSPrimaryVariableMapper::mapPrimaryVariables(), oofem::NonLinearDynamic::proceedStep(), oofem::NonLinearStatic::proceedStep(), oofem::HuertaErrorEstimator::solveRefinedElementProblem(), oofem::HuertaErrorEstimator::solveRefinedWholeProblem(), oofem::LinearStatic::solveYourself(), oofem::FreeWarping::solveYourself(), oofem::StaticStructural::solveYourself(), oofem::NonLinearDynamic::solveYourself(), oofem::NlDEIDynamic::solveYourself(), oofem::NonLinearStatic::solveYourself(), solveYourself(), oofem::DarcyFlow::solveYourselfAt(), oofem::NLTransientTransportProblem::solveYourselfAt(), oofem::StationaryTransportProblem::solveYourselfAt(), oofem::LinearStatic::solveYourselfAt(), oofem::FreeWarping::solveYourselfAt(), oofem::DEIDynamic::solveYourselfAt(), oofem::IncrementalLinearStatic::solveYourselfAt(), oofem::EigenValueDynamic::solveYourselfAt(), oofem::StaticStructural::solveYourselfAt(), oofem::TransientTransportProblem::solveYourselfAt(), oofem::LinearStability::solveYourselfAt(), oofem::StokesFlow::solveYourselfAt(), oofem::DIIDynamic::solveYourselfAt(), oofem::NonLinearDynamic::solveYourselfAt(), oofem::NlDEIDynamic::solveYourselfAt(), oofem::NonStationaryTransportProblem::solveYourselfAt(), oofem::SUPG::solveYourselfAt(), oofem::DIIDynamic::timesMtrx(), oofem::NonLinearDynamic::timesMtrx(), oofem::NonLinearDynamic::unpackMigratingData(), oofem::NonLinearStatic::unpackMigratingData(), oofem::PrescribedGradient::updateCoefficientMatrix(), and oofem::PrescribedGenStrainShell7::updateCoefficientMatrix(). Returns number of domains in problem. Definition at line 342 of file engngm.h. Referenced by forceEquationNumbering(), oofem::MicroMaterial::init(), oofem::oofegGraphicContext::init(), initParallelContexts(), and oofem::oofegGraphicContext::setActiveProblem(). Reimplemented in oofem::StaggeredProblem, oofem::NlDEIDynamic, and oofem::DEIDynamic. Definition at line 730 of file engngm.h. Referenced by oofem::StationaryTransportProblem::giveNextStep(), oofem::FreeWarping::giveNextStep(), oofem::EigenValueDynamic::giveNextStep(), oofem::DIIDynamic::giveNextStep(), oofem::LinearStability::giveNextStep(), oofem::NonLinearDynamic::giveNextStep(), oofem::NonLinearStatic::giveNextStep(), oofem::NonStationaryTransportProblem::giveNextStep(), oofem::StaggeredProblem::giveNumberOfFirstStep(), giveNumberOfFirstStep(), oofem::NonStationaryTransportProblem::giveSolutionStepWhenIcApply(), oofem::AdaptiveNonLinearStatic::giveTimeStepLoadLevel(), oofem::TimeStep::isTheFirstStep(), postInitialize(), and oofem::OutputManager::testTimeStepOutput(). Definition at line 738 of file engngm.h. Definition at line 1060 of file engngm.h. Referenced by oofem::ParmetisLoadBalancer::calculateLoadTransfer(), oofem::StructuralFE2MaterialStatus::copyStateVariables(), oofem::StructuralFE2MaterialStatus::createRVE(), oofem::FE2FluidMaterialStatus::createRVE(), oofem::WallClockLoadBalancerMonitor::decide(), oofem::VTKXMLExportModule::doOutput(), oofem::Subdivision::giveNumberOfProcesses(), oofem::ExportModule::giveOutputBaseFileName(), oofem::MatlabExportModule::giveOutputStream(), oofem::NonlocalMaterialWTP::init(), oofem::Natural2GlobalOrdering::init(), oofem::NodalAveragingRecoveryModel::initCommMaps(), oofem::ZZNodalRecoveryModel::initCommMaps(), oofem::SPRNodalRecoveryModel::initCommMaps(), oofem::ParmetisLoadBalancer::initGlobalParmetisElementNumbering(), oofem::StaticStructural::initializeFrom(), oofem::LinearStatic::initializeFrom(), oofem::DirectErrorIndicatorRC::initializeFrom(), oofem::FreeWarping::initializeFrom(), oofem::NonLinearDynamic::initializeFrom(), oofem::QClinearStatic::initializeFrom(), oofem::NlDEIDynamic::initializeFrom(), oofem::NonLinearStatic::initializeFrom(), oofem::ParmetisLoadBalancer::labelDofManagers(), oofem::NonlocalMaterialWTP::migrate(), oofem::LoadBalancer::migrateLoad(), oofem::RVEStokesFlowMaterialStatus::RVEStokesFlowMaterialStatus(), and oofem::FETISolver::solve(). Reimplemented in oofem::StaggeredProblem, oofem::FluidStructureProblem, and oofem::ProblemSequence. Definition at line 1080 of file engngm.h. Returns total number of steps. Definition at line 744 of file engngm.h. Referenced by oofem::StaticStructural::giveEndOfTimeOfInterest(), giveNumberOfSteps(), oofem::AdaptiveNonLinearStatic::giveTimeStepLoadLevel(), oofem::TimeStep::isNotTheLastStep(), printYourself(), and oofem::AdaptiveNonLinearStatic::updateYourself(). Definition at line 754 of file engngm.h. Referenced by oofem::DarcyFlow::giveNextStep(), oofem::StructuralMaterialEvaluator::giveNextStep(), oofem::LinearStatic::giveNextStep(), oofem::IncrementalLinearStatic::giveNextStep(), oofem::FluidMaterialEvaluator::giveNextStep(), oofem::StaticStructural::giveNextStep(), oofem::StokesFlow::giveNextStep(), oofem::TransientTransportProblem::giveSolutionStepWhenIcApply(), oofem::NonLinearStatic::giveSolutionStepWhenIcApply(), oofem::NonStationaryTransportProblem::giveSolutionStepWhenIcApply(), oofem::SUPG::giveSolutionStepWhenIcApply(), oofem::StaggeredProblem::giveSolutionStepWhenIcApply(), oofem::CBS::giveSolutionStepWhenIcApply(), oofem::MasterDof::giveUnknown(), oofem::DIIDynamic::initializeYourself(), oofem::NonLinearDynamic::initializeYourself(), and oofem::TimeStep::isIcApply(). Returns reference to receiver's numerical method. Reimplemented in oofem::CBS, oofem::PFEM, oofem::SUPG, oofem::NonStationaryTransportProblem, oofem::NonLinearStatic, oofem::NlDEIDynamic, oofem::NonLinearDynamic, oofem::LinearStability, oofem::StokesFlow, oofem::TransientTransportProblem, oofem::IncrementalLinearStatic, oofem::StaticStructural, oofem::DIIDynamic, oofem::EigenValueDynamic, oofem::FreeWarping, oofem::DEIDynamic, oofem::LinearStatic, oofem::StationaryTransportProblem, and oofem::DarcyFlow. Definition at line 756 of file engngm.h. Referenced by restoreContext(), saveContext(), and updateAttributes(). Definition at line 363 of file engngm.h. Referenced by oofem::NodeErrorCheckingRule::check(), oofem::ElementErrorCheckingRule::check(), oofem::BeamElementErrorCheckingRule::check(), oofem::ReactionErrorCheckingRule::check(), oofem::LoadLevelErrorCheckingRule::check(), oofem::EigenValueErrorCheckingRule::check(), oofem::VTKXMLExportModule::doOutput(), oofem::ParticleTopologyDescription::doOutput(), oofem::ExportModule::giveOutputBaseFileName(), oofem::OutputExportModule::giveOutputStream(), oofem::MatlabExportModule::giveOutputStream(), oofem::HOMExportModule::initialize(), oofem::StructuralMaterialEvaluator::solveYourself(), oofem::FluidMaterialEvaluator::solveYourself(), oofem::VTKXMLExportModule::writeGPVTKCollection(), and oofem::VTKXMLExportModule::writeVTKCollection(). Definition at line 1791 of file engngm.C. Referenced by oofem::AdaptiveNonLinearStatic::adaptiveRemap(), oofem::EigenValueDynamic::doStepOutput(), oofem::LinearStability::doStepOutput(), doStepOutput(), oofem::AdaptiveNonLinearStatic::initializeAdaptiveFrom(), oofem::StaggeredProblem::solveYourself(), solveYourself(), terminate(), and terminateAnalysis(). Returns the communication object of reciever. Definition at line 549 of file engngm.h. Referenced by oofem::ParallelContext::accumulate(), oofem::PetscSparseMtrx::buildInternalStructure(), oofem::PetscSparseMtrx::createVecGlobal(), oofem::PetscSparseMtrx::giveSubMatrix(), oofem::ParallelContext::localDotProduct(), oofem::ParallelContext::localNorm(), oofem::PetscSolver::petsc_solve(), oofem::SLEPcSolver::solve(), and oofem::PetscSparseMtrx::writeToFile(). Returns the parallel context corresponding to given domain (n) and unknown type Default implementation returns i-th context from parallelContextList. Definition at line 1745 of file engngm.C. Referenced by oofem::PetscSparseMtrx::assemble(), assembleVector(), oofem::PetscSparseMtrx::buildInternalStructure(), oofem::NRSolver::checkConvergence(), oofem::ZZErrorEstimator::estimateError(), oofem::NRSolver::initPrescribedEqs(), oofem::PetscSparseMtrx::scatterG2L(), oofem::PetscSparseMtrx::scatterL2G(), oofem::SLEPcSolver::solve(), oofem::DynamicRelaxationSolver::solve(), and oofem::NRSolver::solve(). Definition at line 693 of file engngm.h. Referenced by oofem::NLTransientTransportProblem::assembleAlgorithmicPartOfRhs(), oofem::TimeStep::givePreviousStep(), oofem::StaggeredProblem::givePreviousStep(), givePreviousStep(), oofem::NLTransientTransportProblem::giveUnknownComponent(), oofem::SUPG::giveUnknownDictHashIndx(), and oofem::AdaptiveNonLinearStatic::initializeAdaptiveFrom(). Definition at line 591 of file engngm.h. Definition at line 411 of file engngm.h. Returns scale in multiscale simulation. Definition at line 418 of file engngm.h. Referenced by oofem::NRSolver::checkConvergence(), oofem::PetscSolver::petsc_solve(), oofem::DynamicRelaxationSolver::solve(), oofem::NRSolver::solve(), oofem::StaticStructural::solveYourselfAt(), oofem::StokesFlow::solveYourselfAt(), and oofem::Tr21Stokes::Tr21Stokes(). Definition at line 1058 of file engngm.h. Referenced by balanceLoad(), oofem::PetscSparseMtrx::buildInternalStructure(), oofem::ParmetisLoadBalancer::calculateLoadTransfer(), oofem::NlDEIDynamic::computeMassMtrx(), oofem::StructuralFE2MaterialStatus::copyStateVariables(), oofem::T3DInterface::createInput(), oofem::StructuralFE2MaterialStatus::createRVE(), oofem::FE2FluidMaterialStatus::createRVE(), oofem::WallClockLoadBalancerMonitor::decide(), oofem::LoadBalancer::deleteRemoteDofManagers(), oofem::LoadBalancer::deleteRemoteElements(), oofem::VTKXMLExportModule::doOutput(), oofem::HuertaErrorEstimator::estimateError(), oofem::FETISolver::estimateMaxPackSize(), exchangeRemoteElementData(), oofem::ExportModule::giveOutputBaseFileName(), oofem::MatlabExportModule::giveOutputStream(), oofem::DofManager::givePartitionsConnectivitySize(), oofem::Subdivision::giveRank(), oofem::ParallelContext::init(), oofem::NonlocalMaterialWTP::init(), oofem::Natural2GlobalOrdering::init(), oofem::NodalAveragingRecoveryModel::initCommMaps(), oofem::ZZNodalRecoveryModel::initCommMaps(), oofem::SPRNodalRecoveryModel::initCommMaps(), oofem::ParmetisLoadBalancer::initGlobalParmetisElementNumbering(), oofem::StaticStructural::initializeFrom(), oofem::LinearStatic::initializeFrom(), oofem::DirectErrorIndicatorRC::initializeFrom(), oofem::FreeWarping::initializeFrom(), oofem::NonLinearDynamic::initializeFrom(), oofem::QClinearStatic::initializeFrom(), oofem::NlDEIDynamic::initializeFrom(), oofem::NonLinearStatic::initializeFrom(), oofem::ParallelOrdering::isLocal(), oofem::DofManager::isLocal(), oofem::ParmetisLoadBalancer::labelDofManagers(), oofem::NonlocalMaterialWTP::migrate(), oofem::LoadBalancer::migrateLoad(), oofem::LoadBalancer::packMigratingData(), oofem::NonlocalMaterialWTP::packMigratingElementDependencies(), oofem::NonlocalMaterialWTP::packRemoteElements(), oofem::ParmetisLoadBalancer::packSharedDmanPartitions(), oofem::LoadBalancer::printStatistics(), oofem::RVEStokesFlowMaterialStatus::RVEStokesFlowMaterialStatus(), oofem::FETISolver::setUpCommunicationMaps(), oofem::FETISolver::solve(), oofem::HuertaErrorEstimator::solveRefinedElementProblem(), oofem::HuertaErrorEstimator::solveRefinedPatchProblem(), oofem::LinearStatic::solveYourself(), oofem::FreeWarping::solveYourself(), oofem::StaticStructural::solveYourself(), oofem::NonLinearDynamic::solveYourself(), oofem::NlDEIDynamic::solveYourself(), oofem::NonLinearStatic::solveYourself(), oofem::NonLinearDynamic::solveYourselfAt(), oofem::LoadBalancer::unpackMigratingData(), oofem::NonlocalMaterialWTP::unpackMigratingElementDependencies(), oofem::NonlocalMaterialWTP::unpackRemoteElements(), oofem::Subdivision::unpackRemoteElements(), oofem::ParmetisLoadBalancer::unpackSharedDmanPartitions(), updateSharedDofManagers(), and oofem::FETISolver::~FETISolver(). Definition at line 368 of file engngm.h. Definition at line 1082 of file engngm.h. Referenced by oofem::LatticeTransportMaterial::computeConductivity(), oofem::oofegGraphicContext::getActiveProblem(), oofem::LatticeDamage2d::giveRealStressVector(), and oofem::oofegGraphicContext::setActiveProblem(). Returns the user time of the current simulation step in seconds. Definition at line 1802 of file engngm.C. References oofem::EngngModelTimer::EMTT_SolutionStepTimer, oofem::EngngModelTimer::getUtime(), and timer. Referenced by oofem::OutputExportModule::doOutput(), and solveYourself(). Reimplemented in oofem::CBS, oofem::StaggeredProblem, oofem::SUPG, oofem::NonStationaryTransportProblem, oofem::NonLinearStatic, and oofem::TransientTransportProblem. Definition at line 720 of file engngm.h. Referenced by oofem::DofDistributedPrimaryField::applyDefaultInitialCondition(), oofem::PrimaryField::applyDefaultInitialCondition(), oofem::DofDistributedPrimaryField::applyInitialCondition(), oofem::PrimaryField::applyInitialCondition(), oofem::TR1_2D_PFEM::computeCriticalTimeStep(), oofem::TransientTransportProblem::giveSolutionStepWhenIcApply(), oofem::NonLinearStatic::giveSolutionStepWhenIcApply(), oofem::NonStationaryTransportProblem::giveSolutionStepWhenIcApply(), oofem::SUPG::giveSolutionStepWhenIcApply(), oofem::CBS::giveSolutionStepWhenIcApply(), and giveSolutionStepWhenIcApply(). Definition at line 345 of file engngm.h. Definition at line 346 of file engngm.h. Returns reference to receiver timer (EngngModelTimer). Definition at line 760 of file engngm.h. Referenced by oofem::WallClockLoadBalancerMonitor::decide(), and oofem::LoadBalancer::printStatistics(). Unknown at give time step is characterized by its type and mode and by its equation number. This function is used by Dofs, when they are requested for their associated unknowns. Reimplemented in oofem::CBS, oofem::PFEM, oofem::SUPG, oofem::NonLinearStatic, oofem::NonStationaryTransportProblem, oofem::NlDEIDynamic, oofem::NonLinearDynamic, oofem::LinearStability, oofem::AdaptiveNonLinearStatic, oofem::DIIDynamic, oofem::StokesFlow, oofem::StaticStructural, oofem::TransientTransportProblem, oofem::EigenValueDynamic, oofem::IncrementalLinearStatic, oofem::DEIDynamic, oofem::FreeWarping, oofem::LinearStatic, oofem::StationaryTransportProblem, oofem::NLTransientTransportProblem, and oofem::DarcyFlow. Definition at line 503 of file engngm.h. This method is responsible for computing unique dictionary id (ie hash value) from given valueModeType and time step. This function is used by particular dofs to access unknown identified by given parameters from its dictionary using computed index. Usually the hash algorithm should produce index that depend on time step relatively to actual one to avoid storage of complete history. Reimplemented in oofem::PFEM, oofem::SUPG, oofem::NonStationaryTransportProblem, oofem::NonLinearStatic, oofem::NonLinearDynamic, oofem::IncrementalLinearStatic, oofem::StaticStructural, oofem::TransientTransportProblem, and oofem::NLTransientTransportProblem. Definition at line 867 of file engngm.h. Referenced by oofem::MasterDof::giveUnknownsDictionaryValue(), and oofem::MasterDof::updateUnknownsDictionary(). Definition at line 1087 of file engngm.h. Referenced by oofem::NewtonianFluidMaterial::checkConsistency(), oofem::NonlinearFluidMaterial::checkConsistency(), oofem::BinghamFluidMaterial2::checkConsistency(), oofem::OutputExportModule::doOutput(), oofem::SUPGElement::giveCharacteristicMatrix(), oofem::Node::initializeFrom(), printOutputAt(), oofem::Tet1_3D_SUPG::updateStabilizationCoeffs(), oofem::TR1_2D_SUPG_AXI::updateStabilizationCoeffs(), oofem::TR1_2D_SUPG2_AXI::updateStabilizationCoeffs(), oofem::TR1_2D_SUPG2::updateStabilizationCoeffs(), and oofem::TR1_2D_SUPG::updateStabilizationCoeffs(). Default implementation calls initModuleManager::doInit service to invoke initialization by individual init modules. Definition at line 1883 of file engngm.C. This process should typically include restoring old solution, instanciating newly generated domain(s) and by mapping procedure. Reimplemented in oofem::StaggeredProblem, oofem::AdaptiveNonLinearStatic, oofem::FluidStructureProblem, and oofem::AdaptiveLinearStatic. Definition at line 488 of file engngm.h. Definition at line 1942 of file engngm.C. References communicator, nonlocalExt, nonlocCommunicator, OOFEM_ERROR, and oofem::ProblemCommunicator::setUpCommunicationMaps(). Referenced by oofem::AdaptiveNonLinearStatic::adaptiveRemap(), oofem::LinearStatic::solveYourself(), oofem::FreeWarping::solveYourself(), oofem::NonLinearDynamic::solveYourself(), oofem::NlDEIDynamic::solveYourself(), oofem::NonLinearStatic::solveYourself(), oofem::NonLinearDynamic::solveYourselfAt(), oofem::NonLinearDynamic::unpackMigratingData(), and oofem::NonLinearStatic::unpackMigratingData(). InitString can be imagined as data record in component database belonging to receiver. Receiver may use value-name extracting functions to extract particular field from record. Reimplemented in oofem::CBS, oofem::PFEM, oofem::SUPG, oofem::StaggeredProblem, oofem::NonStationaryTransportProblem, oofem::NonLinearStatic, oofem::NlDEIDynamic, oofem::QClinearStatic, oofem::NonLinearDynamic, oofem::TransientTransportProblem, oofem::LinearStability, oofem::StokesFlow, oofem::AdaptiveNonLinearStatic, oofem::DIIDynamic, oofem::FreeWarping, oofem::EigenValueDynamic, oofem::LinearStatic, oofem::DEIDynamic, oofem::StationaryTransportProblem, oofem::FluidMaterialEvaluator, oofem::StaticStructural, oofem::FluidStructureProblem, oofem::IncrementalLinearStatic, oofem::StructuralMaterialEvaluator, oofem::ProblemSequence, oofem::NLTransientTransportProblem, oofem::AdaptiveLinearStatic, and oofem::DarcyFlow. Definition at line 262 of file engngm.C. References _IFT_EngngModel_contextoutputstep, _IFT_EngngModel_eetype, _IFT_EngngModel_forceloadBalancingFlag, _IFT_EngngModel_loadBalancingFlag, _IFT_EngngModel_nmsteps, _IFT_EngngModel_nonLinFormulation, _IFT_EngngModel_nsteps, _IFT_EngngModel_parallelflag, _IFT_EngngModel_profileOpt, _IFT_EngngModel_renumberFlag, _IFT_EngngModel_suppressOutput, oofem::classFactory, contextOutputStep, oofem::ClassFactory::createErrorEstimator(), dataOutputFileName, defaultErrEstimator, force_load_rebalance_in_first_step, giveDomain(), oofem::InputRecord::hasField(), oofem::ErrorEstimator::initializeFrom(), IR_GIVE_FIELD, IR_GIVE_OPTIONAL_FIELD, oofem::IRRT_OK, isParallel(), loadBalancingFlag, nMetaSteps, nonLinFormulation, numberOfSteps, numProcs, OOFEM_ERROR, outputStream, parallelFlag, processor_name, profileOpt, rank, renumberFlag, setUDContextOutputMode(), simulationDescription, startTime, and suppressOutput. Referenced by oofem::DarcyFlow::initializeFrom(), oofem::ProblemSequence::initializeFrom(), oofem::StaticStructural::initializeFrom(), oofem::DEIDynamic::initializeFrom(), oofem::StationaryTransportProblem::initializeFrom(), oofem::LinearStatic::initializeFrom(), oofem::FreeWarping::initializeFrom(), oofem::DIIDynamic::initializeFrom(), oofem::StokesFlow::initializeFrom(), oofem::TransientTransportProblem::initializeFrom(), oofem::NonLinearDynamic::initializeFrom(), oofem::NlDEIDynamic::initializeFrom(), oofem::NonStationaryTransportProblem::initializeFrom(), oofem::StaggeredProblem::initializeFrom(), oofem::SUPG::initializeFrom(), oofem::PFEM::initializeFrom(), oofem::CBS::initializeFrom(), and instanciateYourself(). Provides the opportunity to initialize state variables stored in element integration points according to initial conditions using function initializeYourself() on element level. Should be called when current time step is time step when IC will apply (see EngngModel::giveNumberOfTimeStepWhenIcApply) somewhere from solveYourselfAt function). Implementation must be provided. Default implementation is empty. Reimplemented in oofem::StaggeredProblem, oofem::NonLinearDynamic, oofem::DIIDynamic, and oofem::FluidStructureProblem. Definition at line 482 of file engngm.h. Calls updateAttributes. At the end the meta step input reader finish() service is called in order to allow for unread attribute check. Definition at line 580 of file engngm.C. References oofem::InputRecord::finish(), oofem::MetaStep::giveAttributesRecord(), and updateAttributes(). Referenced by oofem::MacroLSpace::computeStiffnessMatrix(), generateNextStep(), oofem::StaggeredProblem::solveYourself(), solveYourself(), oofem::StokesFlow::solveYourselfAt(), and oofem::SUPG::solveYourselfAt(). Request domain rank and problem size. Definition at line 1890 of file engngm.C. References comm, numProcs, OOFEM_ERROR, OOFEM_LOG_RELEVANT, processor_name, and rank. Must be implemented by derived classes since the governing equation type is required for context creation. Definition at line 1755 of file engngm.C. Initializes solution of new time step. Default implementation resets all internal history variables (in integration points of elements) to previously reached equilibrium values. Can be used for time step restart. Definition at line 1496 of file engngm.C. Referenced by oofem::AdaptiveNonLinearStatic::adaptiveRemap(), oofem::AdaptiveNonLinearStatic::initializeAdaptive(), restoreContext(), and oofem::CylindricalALM::solve(). Initialization of the receiver state (opening the default output stream, empty domain creation, initialization of parallel context, etc) before Initialization form DataReader. Called at the beginning of instanciateYourself. Definition at line 184 of file engngm.C. References oofem::IntArray::clear(), domainList, domainNeqs, domainPrescribedNeqs, initParallelContexts(), ndomains, and oofem::IntArray::resize(). Definition at line 374 of file engngm.C. References metaStepList, nMetaSteps, numberOfSteps, and OOFEM_ERROR. Referenced by oofem::StaggeredProblem::instanciateDefaultMetaStep(), and instanciateYourself(). Instanciate problem domains by calling their instanciateYourself() service. Definition at line 336 of file engngm.C. Instanciate problem meta steps by calling their instanciateYourself() service. Definition at line 350 of file engngm.C. References oofem::DataReader::giveInputRecord(), oofem::DataReader::IR_mstepRec, metaStepList, nMetaSteps, and numberOfSteps. Prints header, opens the outFileName, instanciate itself the receiver using using virtual initializeFrom service and instanciates all problem domains. Definition at line 201 of file engngm.C. References oofem::_postProcessor, coreOutputFileName, exportModuleManager, oofem::InputRecord::finish(), giveProblemMode(), oofem::DataReader::giveReferenceName(), oofem::ExportModuleManager::initialize(), oofem::ExportModuleManager::initializeFrom(), oofem::InitModuleManager::initializeFrom(), initializeFrom(), initModuleManager, Instanciate_init(), instanciateDefaultMetaStep(), instanciateDomains(), instanciateMetaSteps(), oofem::ModuleManager< M >::instanciateYourself(), nMetaSteps, OOFEM_LOG_DEBUG, referenceFileName, simulationDescription, and startTime. Referenced by oofem::InstanciateProblem(), oofem::ProblemSequence::instanciateYourself(), and oofem::StaggeredProblem::instanciateYourself(). Definition at line 1118 of file engngm.h. Referenced by assemble(), assembleExtrapolatedForces(), assembleVectorFromBC(), assembleVectorFromElements(), oofem::QuasicontinuumVTKXMLExportModule::initRegionNodeNumbering(), and oofem::QuasicontinuumVTKXMLExportModule::setupVTKPiece(). Definition at line 1119 of file engngm.h. Definition at line 1056 of file engngm.h. Referenced by oofem::ParallelContext::accumulate(), oofem::AdaptiveNonLinearStatic::adaptiveRemap(), oofem::PetscSparseMtrx::addDiagonal(), oofem::PetscSparseMtrx::assemble(), assembleVector(), assembleVectorFromElements(), oofem::PetscSparseMtrx::buildInternalStructure(), oofem::NodeErrorCheckingRule::check(), oofem::ElementErrorCheckingRule::check(), oofem::BeamElementErrorCheckingRule::check(), oofem::ReactionErrorCheckingRule::check(), oofem::StructuralFE2MaterialStatus::copyStateVariables(), oofem::T3DInterface::createInput(), oofem::StructuralFE2MaterialStatus::createRVE(), oofem::FE2FluidMaterialStatus::createRVE(), oofem::PetscSparseMtrx::createVecGlobal(), oofem::VTKXMLExportModule::doOutput(), errorInfo(), exchangeRemoteElementData(), oofem::Domain::giveNextFreeDofID(), oofem::ParallelContext::giveNumberOfGlobalEqs(), oofem::ParallelContext::giveNumberOfLocalEqs(), oofem::LinearStatic::giveNumericalMethod(), oofem::FreeWarping::giveNumericalMethod(), oofem::ExportModule::giveOutputBaseFileName(), oofem::MatlabExportModule::giveOutputStream(), oofem::ParallelContext::init(), oofem::StaticStructural::initializeFrom(), oofem::LinearStatic::initializeFrom(), oofem::FreeWarping::initializeFrom(), oofem::NonLinearDynamic::initializeFrom(), oofem::QClinearStatic::initializeFrom(), oofem::NonLinearStatic::initializeFrom(), oofem::StaggeredProblem::initializeFrom(), initializeFrom(), oofem::ParallelContext::isLocal(), oofem::ParallelContext::localDotProduct(), oofem::ParallelContext::localNorm(), oofem::NodalAveragingRecoveryModel::recoverValues(), oofem::ZZNodalRecoveryModel::recoverValues(), oofem::RVEStokesFlowMaterialStatus::RVEStokesFlowMaterialStatus(), oofem::PetscSparseMtrx::scatterG2L(), oofem::PetscSparseMtrx::scatterL2G(), oofem::LinearStatic::solveYourself(), oofem::FreeWarping::solveYourself(), oofem::StaticStructural::solveYourself(), oofem::NonLinearDynamic::solveYourself(), oofem::NlDEIDynamic::solveYourself(), oofem::NonLinearStatic::solveYourself(), oofem::NonLinearDynamic::solveYourselfAt(), oofem::PetscSparseMtrx::times(), oofem::PetscSparseMtrx::timesT(), and updateSharedDofManagers(). Sets the base output file name. src New output file name. Definition at line 1777 of file engngm.C. References dataOutputFileName, OOFEM_ERROR, outputStream, and suppressOutput. Outputs all elements in the given set. setNum Set number. If zero, outputs all elements. Definition at line 766 of file engngm.C. References oofem::Element_remote, oofem::Domain::giveElement(), oofem::Set::giveElementList(), oofem::Domain::giveElements(), oofem::Domain::giveSet(), and oofem::Element::printOutputAt(). Outputs all nodes in the given set. Definition at line 739 of file engngm.C. References oofem::DofManager_null, oofem::Domain::giveDofManager(), oofem::Domain::giveDofManagers(), oofem::Set::giveNodeList(), oofem::Domain::giveSet(), and oofem::DofManager::printOutputAt(). Packing function for vector values of DofManagers. Packs vector values of shared/remote DofManagers into send communication buffer of given process communicator. src Source vector + equation numbering. Definition at line 2136 of file engngm.C. References oofem::EngngModel::ArrayWithNumbering::array, oofem::IntArray::at(), oofem::FloatArray::at(), oofem::Domain::giveDofManager(), giveDomain(), oofem::ProcessCommunicator::giveProcessCommunicatorBuff(), oofem::IntArray::giveSize(), oofem::ProcessCommunicator::giveToSendMap(), oofem::EngngModel::ArrayWithNumbering::numbering, and oofem::ProcessCommunicatorBuff::write(). Packs receiver data when rebalancing load. When rebalancing happens, the local numbering will be lost on majority of processors. Instead of identifying values of solution vectors that have to be send/received and then performing renumbering, all solution vectors are assumed to be stored in dof dictionaries before data migration. Then dofs will take care themselves for packing and unpacking. After data migration and local renumbering, the solution vectors will be restored from dof dictionary data back. Definition at line 981 of file engngm.h. Packs data of local element to be received by their remote counterpart on remote partitions. Remote elements are introduced when nonlocal constitutive models are used, in order to allow local averaging procedure (remote elements, which are involved in averaging on local partition are mirrored on this local partition) instead of implementing inefficient fine-grain communication. Remote element data are exchanged only if necessary and once for all of them. Current implementation calls packUnknowns service for all elements listed in given process communicator send map. Definition at line 2097 of file engngm.C. References oofem::IntArray::at(), giveCurrentStep(), giveDomain(), oofem::Domain::giveElement(), oofem::ProcessCommunicator::giveProcessCommunicatorBuff(), oofem::ProcessCommunicatorBuff::giveSendBuff(), oofem::IntArray::giveSize(), and oofem::ProcessCommunicator::giveToSendMap(). Performs post-initialization for all the problem contents (which is called after initializeFrom). Currently, it calls Domain::postInitialize for all problem domains. Definition at line 1869 of file engngm.C. References domainList, giveNumberOfFirstStep(), and metaStepList. Referenced by instanciateDomains(), and oofem::QClinearStatic::postInitialize(). Reimplemented in oofem::PFEM, and oofem::FluidStructureProblem. Definition at line 716 of file engngm.h. Referenced by generateNextStep(), oofem::StaggeredProblem::solveYourself(), and solveYourself(). Called by DofManagers to print Dof specific part. Dof class provides component printing routines, but emodel is responsible for what will be printed at DOF level. Reimplemented in oofem::PFEM, oofem::CBS, oofem::SUPG, oofem::NlDEIDynamic, oofem::NonLinearDynamic, oofem::DIIDynamic, oofem::DEIDynamic, and oofem::FluidStructureProblem. Definition at line 798 of file engngm.C. Referenced by oofem::qcNode::printOutputAt(), and oofem::DofManager::printOutputAt(). Corresponding function for element gauss points is invoked (gaussPoint::printOutputAt). Reimplemented in oofem::StaggeredProblem, oofem::NlDEIDynamic, oofem::NonLinearStatic, oofem::StructuralEngngModel, oofem::NonLinearDynamic, oofem::LinearStability, oofem::FreeWarping, oofem::EigenValueDynamic, and oofem::AdaptiveLinearStatic. Definition at line 695 of file engngm.C. References domainList, oofem::TimeStep::giveTargetTime(), giveVariableScale(), and oofem::VST_Time. Referenced by oofem::OutputExportModule::doOutput(), doStepOutput(), oofem::CBS::giveVariableScale(), oofem::FreeWarping::printOutputAt(), and oofem::StructuralEngngModel::printOutputAt(). Definition at line 720 of file engngm.C. References oofem::IntArray::at(), domainList, oofem::IntArray::giveSize(), outputElements(), and outputNodes(). Prints state of receiver. Useful for debugging. Definition at line 791 of file engngm.C. References giveClassName(), giveNumberOfSteps(), and numberOfEquations. This may of course change the number of equation and in general there is no guarantee that for a certain dof the same equation will be assigned. So the use of DOF unknowns dictionaries is generally recommended. Reimplemented in oofem::NonStationaryTransportProblem, oofem::IncrementalLinearStatic, oofem::TransientTransportProblem, and oofem::StaticStructural. Definition at line 852 of file engngm.h. Referenced by oofem::StaggeredProblem::solveYourself(), and solveYourself(). Indicates if EngngModel requires Dofs dictionaries to be updated. If EngngModel does not support changes of static system, the dof forwards the requests for its unknowns to EngngModel, where unknowns are naturally kept. This is possible, because dof equation number is same during whole solution. But when changes of static system are allowed, several problem arise. For example by solving simple incremental static with allowed static changes, the incremental displacement vector of structure can not be added to total displacement vector of structure, because equation numbers may have changed, and one can not simply add these vector to obtain new total displacement vector, because incompatible displacement will be added. To solve this problem, unknown dictionary at dof level has been assumed. Dof then keeps its unknowns in its own private dictionary. After computing increment of solution, engngModel updates for each dof its unknowns in its dictionary (using updateUnknownsDictionary function). For aforementioned example engngModel updates incremental values but also total value by asking dof for previous total value (dof will use its dictionary, does not asks back EngngModel) adds corresponding increment and updates total value in dictionary. Reimplemented in oofem::PFEM, oofem::SUPG, oofem::NonStationaryTransportProblem, oofem::IncrementalLinearStatic, oofem::StaticStructural, and oofem::TransientTransportProblem. Definition at line 845 of file engngm.h. Referenced by oofem::LinearStability::doStepOutput(), oofem::MasterDof::giveUnknown(), oofem::PetscSolver::petsc_solve(), oofem::EigenValueDynamic::printOutputAt(), oofem::LinearStability::printOutputAt(), oofem::MasterDof::restoreContext(), oofem::MasterDof::saveContext(), oofem::LinearStability::terminateLinStatic(), oofem::StructuralEngngModel::updateInternalState(), and oofem::CBS::updateInternalState(). Sets the renumber flag to false. Definition at line 422 of file engngm.h. Restores not only the receiver state, but also same function is invoked for all DofManagers and Elements in associated domain. Note that by restoring element context also contexts of all associated integration points (and material statuses) are restored. Each context is associated with unique time step. Only one context per time step is allowed. Restore context function will restore such context, which is related (through its step number) to time step number and version given in obj parameter. Restoring context will change current time step in order to correspond to newly restored context. mode Determines amount of info in stream. ContextIOERR exception if error encountered. Reimplemented in oofem::CBS, oofem::PFEM, oofem::StaggeredProblem, oofem::SUPG, oofem::NonLinearStatic, oofem::NonStationaryTransportProblem, oofem::NlDEIDynamic, oofem::NonLinearDynamic, oofem::AdaptiveNonLinearStatic, oofem::DIIDynamic, oofem::StaticStructural, oofem::LinearStability, oofem::TransientTransportProblem, oofem::EigenValueDynamic, oofem::IncrementalLinearStatic, oofem::ProblemSequence, oofem::LinearStatic, oofem::StationaryTransportProblem, oofem::AdaptiveLinearStatic, and oofem::DarcyFlow. Definition at line 1592 of file engngm.C. References oofem::CIO_IOERR, oofem::CIO_OK, currentStep, domainList, domainNeqs, domainPrescribedNeqs, giveCurrentMetaStep(), giveMetaStep(), giveNumericalMethod(), initStepIncrements(), nMetaSteps, numberOfEquations, numberOfPrescribedEquations, previousStep, oofem::DataStream::read(), renumberFlag, oofem::NumericalMethod::restoreContext(), oofem::IntArray::restoreYourself(), THROW_CIOERR, updateAttributes(), and updateDomainLinks(). Referenced by oofem::HuertaErrorEstimator::estimateError(), oofem::StationaryTransportProblem::restoreContext(), oofem::LinearStatic::restoreContext(), oofem::ProblemSequence::restoreContext(), oofem::IncrementalLinearStatic::restoreContext(), oofem::EigenValueDynamic::restoreContext(), oofem::TransientTransportProblem::restoreContext(), oofem::LinearStability::restoreContext(), oofem::DIIDynamic::restoreContext(), oofem::StaticStructural::restoreContext(), oofem::NonLinearDynamic::restoreContext(), oofem::NlDEIDynamic::restoreContext(), oofem::NonStationaryTransportProblem::restoreContext(), oofem::NonLinearStatic::restoreContext(), oofem::SUPG::restoreContext(), oofem::StaggeredProblem::restoreContext(), oofem::PFEM::restoreContext(), and oofem::CBS::restoreContext(). Stores not only the receiver state, but also same function is invoked for all DofManagers and Elements in associated domain. Note that by storing element context also contexts of all associated integration points (and material statuses) are stored. Reimplemented in oofem::CBS, oofem::PFEM, oofem::StaggeredProblem, oofem::SUPG, oofem::NonLinearStatic, oofem::NonStationaryTransportProblem, oofem::NlDEIDynamic, oofem::NonLinearDynamic, oofem::AdaptiveNonLinearStatic, oofem::DIIDynamic, oofem::StaticStructural, oofem::LinearStability, oofem::TransientTransportProblem, oofem::EigenValueDynamic, oofem::IncrementalLinearStatic, oofem::ProblemSequence, oofem::LinearStatic, oofem::StationaryTransportProblem, and oofem::DarcyFlow. Definition at line 1527 of file engngm.C. References oofem::CIO_IOERR, oofem::CIO_OK, domainList, domainNeqs, domainPrescribedNeqs, giveCurrentStep(), giveMetaStep(), giveNumericalMethod(), numberOfEquations, numberOfPrescribedEquations, renumberFlag, oofem::NumericalMethod::saveContext(), oofem::IntArray::storeYourself(), THROW_CIOERR, and oofem::DataStream::write(). Referenced by oofem::StationaryTransportProblem::saveContext(), oofem::LinearStatic::saveContext(), oofem::ProblemSequence::saveContext(), oofem::IncrementalLinearStatic::saveContext(), oofem::EigenValueDynamic::saveContext(), oofem::TransientTransportProblem::saveContext(), oofem::LinearStability::saveContext(), oofem::DIIDynamic::saveContext(), oofem::StaticStructural::saveContext(), oofem::NonLinearDynamic::saveContext(), oofem::NlDEIDynamic::saveContext(), oofem::NonStationaryTransportProblem::saveContext(), oofem::NonLinearStatic::saveContext(), oofem::SUPG::saveContext(), oofem::StaggeredProblem::saveContext(), oofem::PFEM::saveContext(), oofem::CBS::saveContext(), and saveStepContext(). Saves context of given solution step, if required (determined using this->giveContextOutputMode() method). Definition at line 682 of file engngm.C. References oofem::COM_Always, oofem::COM_Required, oofem::COM_UserDefined, giveContextFileName(), giveContextOutputMode(), giveContextOutputStep(), giveCurrentStep(), oofem::TimeStep::giveNumber(), and saveContext(). Referenced by oofem::NonLinearStatic::terminate(), and terminate(). Only relevant for eigen value analysis. Otherwise does noting. Definition at line 524 of file engngm.h. Sets context output mode of receiver. Definition at line 388 of file engngm.h. Referenced by oofem::InstanciateProblem(), and oofem::AdaptiveNonLinearStatic::solveYourselfAt(). Sets i-th domain of receiver. Given domain is assumed to be owned (and deleted) by receiver. The old domain, if defined, will be deleted. ptr Pointer to valid domain instance. Definition at line 1732 of file engngm.C. Definition at line 352 of file engngm.h. Sets the problem to run in parallel (or not). Definition at line 174 of file engngm.C. Sets domain mode to given mode. Definition at line 404 of file engngm.h. Sets scale in multiscale simulation. Definition at line 416 of file engngm.h. Definition at line 420 of file engngm.h. Sets user defined context output mode (it sets contextOutputMode to contextOutputMode), setting contextOutputStep to given value. Definition at line 395 of file engngm.h. Reimplemented in oofem::StaggeredProblem, oofem::StructuralEngngModel, oofem::NonLinearStatic, oofem::NonLinearDynamic, oofem::FluidStructureProblem, and oofem::ProblemSequence. Definition at line 1130 of file engngm.h. Implementation should invoke for each time step solveYourselfAt function with time step as parameter. Time steps are created using giveNextStep function (this will set current time step to newly created, and updates previous step). Reimplemented in oofem::StaggeredProblem, oofem::NonLinearStatic, oofem::NlDEIDynamic, oofem::QClinearStatic, oofem::NonLinearDynamic, oofem::DIIDynamic, oofem::LinearStability, oofem::StaticStructural, oofem::FluidMaterialEvaluator, oofem::IncrementalLinearStatic, oofem::FreeWarping, oofem::StructuralMaterialEvaluator, oofem::LinearStatic, and oofem::ProblemSequence. Definition at line 501 of file engngm.C. References balanceLoad(), currentStep, oofem::EngngModelTimer::EMTT_AnalysisTimer, oofem::EngngModelTimer::EMTT_NetComputationalStepTimer, oofem::EngngModelTimer::EMTT_SolutionStepTimer, forceEquationNumbering(), giveCurrentStep(), giveMetaStep(), giveNextStep(), giveNumberOfDomainEquations(), giveOutputStream(), giveSolutionStepTime(), oofem::MetaStep::giveStepRelativeNumber(), initializeYourself(), initMetaStepAttributes(), oofem::EngngModelTimer::initTimer(), loadBalancingFlag, nMetaSteps, OOFEM_LOG_DEBUG, OOFEM_LOG_INFO, preInitializeNextStep(), requiresEquationRenumbering(), solveYourselfAt(), oofem::EngngModelTimer::startTimer(), oofem::EngngModelTimer::stopTimer(), suppressOutput, terminate(), timer, and updateYourself(). Referenced by oofem::HuertaErrorEstimator::solveRefinedElementProblem(), oofem::HuertaErrorEstimator::solveRefinedPatchProblem(), oofem::HuertaErrorEstimator::solveRefinedWholeProblem(), oofem::LinearStatic::solveYourself(), oofem::FreeWarping::solveYourself(), oofem::IncrementalLinearStatic::solveYourself(), oofem::StaticStructural::solveYourself(), oofem::DIIDynamic::solveYourself(), oofem::NonLinearDynamic::solveYourself(), oofem::NlDEIDynamic::solveYourself(), and oofem::NonLinearStatic::solveYourself(). Should assemble characteristic matrices and vectors if necessary and solve problem using appropriate numerical method. After finishing solution, this->updateYourself function for updating solution state and then this->terminate function (for updating nodal and element values) should be called. Reimplemented in oofem::CBS, oofem::PFEM, oofem::SUPG, oofem::StaggeredProblem, oofem::NonStationaryTransportProblem, oofem::NonLinearStatic, oofem::NlDEIDynamic, oofem::QClinearStatic, oofem::NonLinearDynamic, oofem::AdaptiveNonLinearStatic, oofem::DIIDynamic, oofem::LinearStability, oofem::TransientTransportProblem, oofem::StokesFlow, oofem::StaticStructural, oofem::EigenValueDynamic, oofem::IncrementalLinearStatic, oofem::DEIDynamic, oofem::FreeWarping, oofem::FluidStructureProblem, oofem::LinearStatic, oofem::StationaryTransportProblem, oofem::NLTransientTransportProblem, and oofem::DarcyFlow. Definition at line 451 of file engngm.h. Referenced by oofem::FE2FluidMaterial::computeDeviatoricStressVector(), oofem::MacroLSpace::giveInternalForcesVector(), oofem::StructuralFE2Material::giveRealStressVector_3d(), oofem::XfemSolverInterface::propagateXfemInterfaces(), and solveYourself(). Default implementation calls prinOutput() service and if specified, context of whole domain is stored and output for given time step is printed. Reimplemented in oofem::StaggeredProblem, oofem::StructuralEngngModel, oofem::NonLinearStatic, and oofem::StaticStructural. Definition at line 656 of file engngm.C. References CM_Definition, CM_State, oofem::ExportModuleManager::doOutput(), doStepOutput(), exportModuleManager, giveOutputStream(), saveStepContext(), and suppressOutput. Referenced by solveYourself(), oofem::StructuralEngngModel::terminate(), and oofem::MacroLSpace::updateYourself(). Performs analysis termination after finishing analysis. Definition at line 1819 of file engngm.C. References oofem::EngngModelTimer::EMTT_AnalysisTimer, exportModuleManager, giveAnalysisTime(), giveOutputStream(), OOFEM_LOG_FORCED, oofem::EngngModelTimer::stopTimer(), suppressOutput, oofem::ExportModuleManager::terminate(), and timer. Referenced by oofem::HuertaErrorEstimator::solveRefinedElementProblem(), oofem::HuertaErrorEstimator::solveRefinedPatchProblem(), oofem::HuertaErrorEstimator::solveRefinedWholeProblem(), and oofem::AdaptiveNonLinearStatic::solveYourselfAt(). Unpacking function for vector values of DofManagers . Unpacks vector of shared/remote DofManagers from receive communication buffer of given process communicator. dest Destination vector + equation numbering. Definition at line 2164 of file engngm.C. References oofem::EngngModel::ArrayWithNumbering::array, oofem::IntArray::at(), oofem::FloatArray::at(), oofem::DofManager_remote, oofem::DofManager_shared, oofem::Domain::giveDofManager(), giveDomain(), oofem::DofManager::giveParallelMode(), oofem::ProcessCommunicator::giveProcessCommunicatorBuff(), oofem::IntArray::giveSize(), oofem::ProcessCommunicator::giveToRecvMap(), oofem::EngngModel::ArrayWithNumbering::numbering, OOFEM_ERROR, and oofem::ProcessCommunicatorBuff::read(). Unpacks receiver data when rebalancing load. Definition at line 988 of file engngm.h. Unpacks data for remote elements (which are mirrors of remote partition's local elements). Remote elements are introduced when nonlocal constitutive models are used, in order to allow local averaging procedure (remote elements, which are involved in averaging on local partition are mirrored on this local partition) instead of implementing inefficient fine-grain communication. Remote element data are exchanged only if necessary and once for all of them. Current implementation calls unpackAndUpdateUnknowns service for all elements listed in given process communicator receive map. Definition at line 2114 of file engngm.C. References oofem::IntArray::at(), oofem::Element_remote, giveCurrentStep(), giveDomain(), oofem::Domain::giveElement(), oofem::Element::giveParallelMode(), oofem::ProcessCommunicator::giveProcessCommunicatorBuff(), oofem::ProcessCommunicatorBuff::giveRecvBuff(), oofem::IntArray::giveSize(), oofem::ProcessCommunicator::giveToRecvMap(), OOFEM_ERROR, and oofem::Element::unpackAndUpdateUnknowns(). Allows the certain parameters or attributes to be updated for particular metastep. The metastep provides the attributes record, from which the corresponding attributes can be read. The service takes a MetaStep parameter. It is recommended, to implement this service in such way, that multiple calls for steps belonging to same MetaStep does not change response. The default implementation updates the numerical method attributes. Reimplemented in oofem::StaggeredProblem, oofem::NonLinearStatic, oofem::NonLinearDynamic, and oofem::StaticStructural. Definition at line 589 of file engngm.C. References oofem::MetaStep::giveAttributesRecord(), giveLoadBalancer(), giveLoadBalancerMonitor(), giveMetaStep(), oofem::MetaStep::giveNumber(), giveNumericalMethod(), oofem::LoadBalancerMonitor::initializeFrom(), oofem::NumericalMethod::initializeFrom(), and oofem::LoadBalancer::initializeFrom(). Referenced by initMetaStepAttributes(), restoreContext(), oofem::LinearStability::solveYourself(), oofem::StaticStructural::updateAttributes(), oofem::NonLinearDynamic::updateAttributes(), oofem::NonLinearStatic::updateAttributes(), and oofem::StaggeredProblem::updateAttributes(). Updates components mapped to numerical method if necessary during solution process. Some numerical methods may require updating mapped components during solution process (e.g., updating of tangent stiffness when using updated Newton-Raphson method). tStep Time when component is updated. cmpn Numerical component to update. Reimplemented in oofem::SUPG, oofem::NonLinearStatic, oofem::NonLinearDynamic, oofem::StokesFlow, oofem::StaticStructural, oofem::TransientTransportProblem, oofem::StationaryTransportProblem, and oofem::DarcyFlow. Definition at line 1485 of file engngm.C. Referenced by oofem::CylindricalALM::do_lineSearch(), oofem::DynamicRelaxationSolver::solve(), oofem::LineSearchNM::solve(), oofem::NRSolver::solve(), and oofem::CylindricalALM::solve(). Updates necessary values in Dofs unknown dictionaries. Reimplemented in oofem::PFEM, oofem::SUPG, oofem::IncrementalLinearStatic, and oofem::NLTransientTransportProblem. Definition at line 859 of file engngm.h. Referenced by oofem::LinearStability::doStepOutput(), oofem::EigenValueDynamic::printOutputAt(), oofem::LinearStability::printOutputAt(), oofem::LinearStability::terminateLinStatic(), oofem::StructuralEngngModel::updateInternalState(), and oofem::CBS::updateInternalState(). Used mainly after restoring context - the domains may change and this service is then used to update domain variables in all components belonging to receiver like error estimators, solvers, etc, having domains as attributes. Reimplemented in oofem::CBS, oofem::StaggeredProblem, oofem::SUPG, oofem::NonLinearStatic, oofem::NonStationaryTransportProblem, oofem::NonLinearDynamic, oofem::AdaptiveNonLinearStatic, oofem::TransientTransportProblem, oofem::StaticStructural, oofem::FreeWarping, oofem::LinearStatic, oofem::StationaryTransportProblem, and oofem::AdaptiveLinearStatic. Definition at line 1521 of file engngm.C. Referenced by restoreContext(), oofem::StationaryTransportProblem::updateDomainLinks(), oofem::LinearStatic::updateDomainLinks(), oofem::FreeWarping::updateDomainLinks(), oofem::StaticStructural::updateDomainLinks(), oofem::TransientTransportProblem::updateDomainLinks(), oofem::NonLinearDynamic::updateDomainLinks(), oofem::NonStationaryTransportProblem::updateDomainLinks(), oofem::SUPG::updateDomainLinks(), and oofem::CBS::updateDomainLinks(). Exchanges necessary remote DofManagers data. answer Array with collected values. Definition at line 1957 of file engngm.C. References oofem::EngngModel::ArrayWithNumbering::array, communicator, oofem::Communicator::finishExchange(), giveRank(), oofem::Communicator::initExchange(), isParallel(), oofem::EngngModel::ArrayWithNumbering::numbering, OOFEM_ERROR, oofem::Communicator::packAllData(), packDofManagers(), oofem::Communicator::unpackAllData(), unpackDofManagers(), and VERBOSEPARALLEL_PRINT. Referenced by oofem::NonLinearStatic::assembleIncrementalReferenceLoadVectors(), oofem::DIIDynamic::assembleLoadVector(), oofem::NlDEIDynamic::computeLoadVector(), oofem::NlDEIDynamic::computeMassMtrx(), oofem::StructuralEngngModel::computeReaction(), oofem::StructuralEngngModel::giveInternalForces(), oofem::NonLinearDynamic::proceedStep(), oofem::DarcyFlow::solveYourselfAt(), oofem::StationaryTransportProblem::solveYourselfAt(), oofem::LinearStatic::solveYourselfAt(), oofem::FreeWarping::solveYourselfAt(), oofem::DEIDynamic::solveYourselfAt(), oofem::IncrementalLinearStatic::solveYourselfAt(), oofem::StaticStructural::solveYourselfAt(), oofem::StokesFlow::solveYourselfAt(), oofem::TransientTransportProblem::solveYourselfAt(), oofem::LinearStability::solveYourselfAt(), oofem::SUPG::solveYourselfAt(), oofem::NonLinearDynamic::timesMtrx(), oofem::DarcyFlow::updateComponent(), oofem::StationaryTransportProblem::updateComponent(), oofem::TransientTransportProblem::updateComponent(), oofem::StaticStructural::updateComponent(), oofem::StokesFlow::updateComponent(), and oofem::SUPG::updateComponent(). (for example total values may be updated according to previously solved increments). Then element values are also updated (together with related integration points and material statuses). Reimplemented in oofem::CBS, oofem::PFEM, oofem::SUPG, oofem::StaggeredProblem, oofem::NonStationaryTransportProblem, oofem::NlDEIDynamic, oofem::StructuralEngngModel, oofem::NonLinearDynamic, oofem::TransientTransportProblem, oofem::AdaptiveNonLinearStatic, oofem::DIIDynamic, oofem::LinearStability, oofem::StokesFlow, oofem::EigenValueDynamic, oofem::StationaryTransportProblem, oofem::NLTransientTransportProblem, oofem::AdaptiveLinearStatic, and oofem::DarcyFlow. Definition at line 612 of file engngm.C. References defaultErrEstimator, domainList, oofem::Element_remote, oofem::equilibratedEM, oofem::ErrorEstimator::estimateError(), and VERBOSE_PRINT0. Referenced by oofem::MacroLSpace::giveInternalForcesVector(), solveYourself(), oofem::DarcyFlow::updateYourself(), oofem::StationaryTransportProblem::updateYourself(), oofem::StokesFlow::updateYourself(), oofem::TransientTransportProblem::updateYourself(), oofem::StructuralEngngModel::updateYourself(), oofem::NonStationaryTransportProblem::updateYourself(), oofem::StaggeredProblem::updateYourself(), oofem::SUPG::updateYourself(), oofem::PFEM::updateYourself(), and oofem::CBS::updateYourself(). Reimplemented in oofem::StaggeredProblem, oofem::NonLinearStatic, oofem::NonLinearDynamic, and oofem::FluidStructureProblem. Definition at line 1054 of file engngm.h. Communication object for this engineering model. Definition at line 286 of file engngm.h. Referenced by assembleVector(), EngngModel(), and initParallel(). Definition at line 301 of file engngm.h. Referenced by EngngModel(), oofem::StaticStructural::initializeFrom(), oofem::LinearStatic::initializeFrom(), oofem::FreeWarping::initializeFrom(), oofem::NonLinearDynamic::initializeFrom(), oofem::QClinearStatic::initializeFrom(), oofem::NlDEIDynamic::initializeFrom(), oofem::NonLinearStatic::initializeFrom(), and ~EngngModel(). Definition at line 303 of file engngm.h. Referenced by EngngModel(), initializeCommMaps(), oofem::StaticStructural::initializeFrom(), oofem::LinearStatic::initializeFrom(), oofem::FreeWarping::initializeFrom(), oofem::NonLinearDynamic::initializeFrom(), oofem::QClinearStatic::initializeFrom(), oofem::NlDEIDynamic::initializeFrom(), oofem::NonLinearStatic::initializeFrom(), oofem::StaticStructural::solveYourself(), updateSharedDofManagers(), and ~EngngModel(). Definition at line 265 of file engngm.h. Referenced by EngngModel(), and ~EngngModel(). Definition at line 246 of file engngm.h. Referenced by EngngModel(), oofem::StaggeredProblem::instanciateSlaveProblems(), and oofem::ProblemSequence::instanciateYourself(). Definition at line 247 of file engngm.h. Referenced by EngngModel(), and initializeFrom(). String with core output file name. Definition at line 240 of file engngm.h. Referenced by giveContextFileName(), giveDomainFileName(), and instanciateYourself(). Definition at line 231 of file engngm.h. Referenced by oofem::NLTransientTransportProblem::assembleAlgorithmicPartOfRhs(), generateNextStep(), oofem::StaggeredProblem::giveDeltaT(), oofem::DarcyFlow::giveNextStep(), oofem::NLTransientTransportProblem::giveNextStep(), oofem::StationaryTransportProblem::giveNextStep(), oofem::StructuralMaterialEvaluator::giveNextStep(), oofem::LinearStatic::giveNextStep(), oofem::DEIDynamic::giveNextStep(), oofem::IncrementalLinearStatic::giveNextStep(), oofem::FluidMaterialEvaluator::giveNextStep(), oofem::FreeWarping::giveNextStep(), oofem::EigenValueDynamic::giveNextStep(), oofem::DIIDynamic::giveNextStep(), oofem::StaticStructural::giveNextStep(), oofem::TransientTransportProblem::giveNextStep(), oofem::LinearStability::giveNextStep(), oofem::StokesFlow::giveNextStep(), oofem::NonLinearDynamic::giveNextStep(), oofem::NlDEIDynamic::giveNextStep(), oofem::NonLinearStatic::giveNextStep(), oofem::NonStationaryTransportProblem::giveNextStep(), oofem::SUPG::giveNextStep(), oofem::StaggeredProblem::giveNextStep(), oofem::CBS::giveNextStep(), oofem::NLTransientTransportProblem::giveUnknownComponent(), oofem::AdaptiveNonLinearStatic::initializeAdaptiveFrom(), restoreContext(), and solveYourself(). Definition at line 238 of file engngm.h. Referenced by oofem::IncrementalLinearStatic::initializeFrom(), oofem::EigenValueDynamic::initializeFrom(), oofem::LinearStability::initializeFrom(), oofem::StaggeredProblem::initializeFrom(), initializeFrom(), oofem::ProblemSequence::instanciateYourself(), and letOutputBaseFileNameBe(). Error estimator. Useful for adaptivity, or simply printing errors output. Definition at line 273 of file engngm.h. Referenced by EngngModel(), oofem::AdaptiveNonLinearStatic::initializeFrom(), initializeFrom(), oofem::AdaptiveLinearStatic::printOutputAt(), oofem::AdaptiveNonLinearStatic::solveYourselfAt(), oofem::AdaptiveLinearStatic::updateDomainLinks(), oofem::AdaptiveNonLinearStatic::updateDomainLinks(), oofem::AdaptiveLinearStatic::updateYourself(), updateYourself(), and ~EngngModel(). Definition at line 207 of file engngm.h. Referenced by oofem::AdaptiveNonLinearStatic::adaptiveRemap(), checkProblemConsistency(), oofem::NLTransientTransportProblem::createPreviousSolutionInDofUnknownsDictionary(), giveDomain(), oofem::CBS::giveVariableScale(), oofem::StaggeredProblem::initializeFrom(), initStepIncrements(), Instanciate_init(), instanciateDomains(), postInitialize(), printOutputAt(), restoreContext(), saveContext(), setDomain(), oofem::NLTransientTransportProblem::updateInternalState(), oofem::StationaryTransportProblem::updateInternalState(), oofem::StokesFlow::updateInternalState(), oofem::StructuralEngngModel::updateInternalState(), oofem::SUPG::updateInternalState(), oofem::NonStationaryTransportProblem::updateInternalState(), oofem::CBS::updateInternalState(), oofem::NonStationaryTransportProblem::updateYourself(), and updateYourself(). Definition at line 215 of file engngm.h. Referenced by oofem::AdaptiveNonLinearStatic::adaptiveRemap(), oofem::FluidModel::forceEquationNumbering(), forceEquationNumbering(), giveNumberOfDomainEquations(), oofem::StaggeredProblem::initializeFrom(), Instanciate_init(), restoreContext(), and saveContext(). Definition at line 217 of file engngm.h. Definition at line 223 of file engngm.h. Referenced by oofem::AdaptiveNonLinearStatic::adaptiveRemap(), EngngModel(), oofem::DarcyFlow::forceEquationNumbering(), oofem::StokesFlow::forceEquationNumbering(), forceEquationNumbering(), oofem::CBS::giveNumberOfDomainEquations(), and giveNumberOfDomainEquations(). Definition at line 250 of file engngm.h. Referenced by oofem::EigenValueDynamic::doStepOutput(), oofem::LinearStability::doStepOutput(), doStepOutput(), EngngModel(), instanciateYourself(), terminate(), terminateAnalysis(), and ~EngngModel(). Debug flag forcing load balancing after first step. Definition at line 297 of file engngm.h. Referenced by balanceLoad(), EngngModel(), and initializeFrom(). Definition at line 252 of file engngm.h. Referenced by EngngModel(), init(), instanciateYourself(), and ~EngngModel(). Definition at line 292 of file engngm.h. Referenced by balanceLoad(), EngngModel(), oofem::AdaptiveNonLinearStatic::giveLoadBalancer(), oofem::NonLinearDynamic::giveLoadBalancer(), oofem::NonLinearStatic::giveLoadBalancer(), and ~EngngModel(). Definition at line 293 of file engngm.h. Referenced by balanceLoad(), EngngModel(), oofem::AdaptiveNonLinearStatic::giveLoadBalancerMonitor(), oofem::NonLinearDynamic::giveLoadBalancerMonitor(), oofem::NonLinearStatic::giveLoadBalancerMonitor(), and ~EngngModel(). Definition at line 295 of file engngm.h. Referenced by EngngModel(), oofem::AdaptiveNonLinearStatic::giveLoadBalancer(), oofem::NonLinearDynamic::giveLoadBalancer(), oofem::NonLinearStatic::giveLoadBalancer(), oofem::AdaptiveNonLinearStatic::giveLoadBalancerMonitor(), oofem::NonLinearDynamic::giveLoadBalancerMonitor(), oofem::NonLinearStatic::giveLoadBalancerMonitor(), initializeFrom(), oofem::StaggeredProblem::solveYourself(), solveYourself(), and ~EngngModel(). Master e-model; if defined receiver is in maintained (slave) mode. Definition at line 262 of file engngm.h. Referenced by EngngModel(), oofem::TransientTransportProblem::giveSolutionStepWhenIcApply(), oofem::NonLinearStatic::giveSolutionStepWhenIcApply(), oofem::NonStationaryTransportProblem::giveSolutionStepWhenIcApply(), oofem::SUPG::giveSolutionStepWhenIcApply(), oofem::CBS::giveSolutionStepWhenIcApply(), and ~EngngModel(). Definition at line 227 of file engngm.h. Referenced by giveMetaStep(), instanciateDefaultMetaStep(), instanciateMetaSteps(), and postInitialize(). Definition at line 205 of file engngm.h. Referenced by oofem::AdaptiveNonLinearStatic::adaptiveRemap(), oofem::CBS::CBS(), oofem::DarcyFlow::DarcyFlow(), oofem::DEIDynamic::DEIDynamic(), oofem::DIIDynamic::DIIDynamic(), oofem::EigenValueDynamic::EigenValueDynamic(), EngngModel(), oofem::FluidMaterialEvaluator::FluidMaterialEvaluator(), oofem::FluidStructureProblem::FluidStructureProblem(), oofem::FreeWarping::FreeWarping(), oofem::IncrementalLinearStatic::IncrementalLinearStatic(), oofem::StaggeredProblem::initializeFrom(), Instanciate_init(), oofem::LinearStability::LinearStability(), oofem::LinearStatic::LinearStatic(), oofem::NlDEIDynamic::NlDEIDynamic(), oofem::NonLinearDynamic::NonLinearDynamic(), oofem::NonStationaryTransportProblem::NonStationaryTransportProblem(), oofem::StaggeredProblem::StaggeredProblem(), oofem::StaticStructural::StaticStructural(), oofem::StationaryTransportProblem::StationaryTransportProblem(), oofem::StokesFlow::StokesFlow(), oofem::StructuralMaterialEvaluator::StructuralMaterialEvaluator(), oofem::SUPG::SUPG(), and oofem::TransientTransportProblem::TransientTransportProblem(). Definition at line 225 of file engngm.h. Referenced by EngngModel(), generateNextStep(), giveMetaStep(), oofem::NonLinearDynamic::giveNextStep(), oofem::NonLinearStatic::giveNextStep(), oofem::LinearStability::initializeFrom(), initializeFrom(), instanciateDefaultMetaStep(), instanciateMetaSteps(), instanciateYourself(), restoreContext(), and solveYourself(). Type of non linear formulation (total or updated formulation). Definition at line 271 of file engngm.h. Referenced by EngngModel(), oofem::NLTransientTransportProblem::giveFormulation(), oofem::NonLinearDynamic::giveFormulation(), oofem::NonLinearStatic::giveFormulation(), and initializeFrom(). Flag indicating if nonlocal extension active, which will cause data to be sent between shared elements before computing the internal forces. Definition at line 280 of file engngm.h. Referenced by EngngModel(), exchangeRemoteElementData(), initializeCommMaps(), oofem::StaticStructural::initializeFrom(), oofem::NonLinearDynamic::initializeFrom(), oofem::NlDEIDynamic::initializeFrom(), oofem::NonLinearStatic::initializeFrom(), and oofem::StaticStructural::solveYourself(). NonLocal Communicator. Necessary when nonlocal constitutive models are used. Definition at line 306 of file engngm.h. 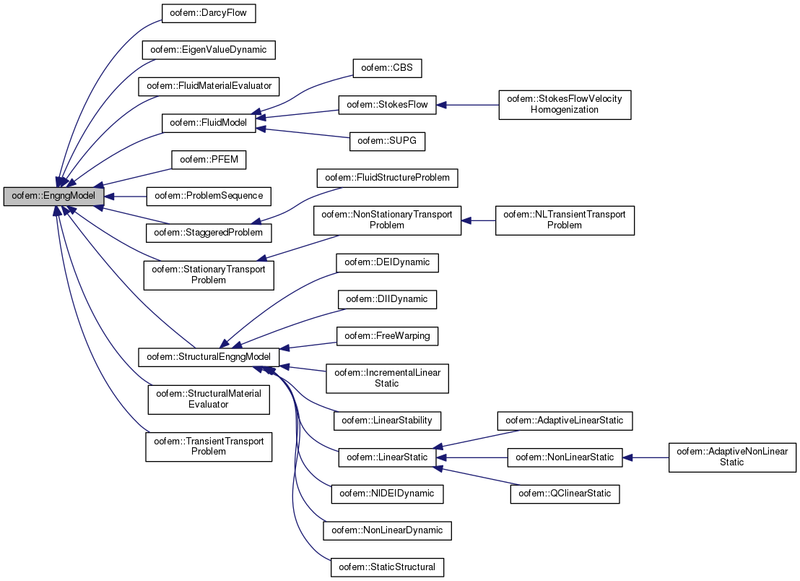 Referenced by EngngModel(), exchangeRemoteElementData(), initializeCommMaps(), oofem::StaticStructural::initializeFrom(), oofem::NonLinearDynamic::initializeFrom(), oofem::NlDEIDynamic::initializeFrom(), oofem::NonLinearStatic::initializeFrom(), oofem::StaticStructural::solveYourself(), and ~EngngModel(). Definition at line 235 of file engngm.h. Total number of equation in current time step. Definition at line 211 of file engngm.h. Referenced by oofem::AdaptiveNonLinearStatic::adaptiveRemap(), EngngModel(), forceEquationNumbering(), printYourself(), restoreContext(), and saveContext(). Total number or prescribed equations in current time step. Definition at line 213 of file engngm.h. Referenced by oofem::AdaptiveNonLinearStatic::adaptiveRemap(), EngngModel(), forceEquationNumbering(), restoreContext(), and saveContext(). Definition at line 209 of file engngm.h. Referenced by oofem::EigenValueDynamic::EigenValueDynamic(), EngngModel(), oofem::StaggeredProblem::giveNextStep(), oofem::StructuralMaterialEvaluator::initializeFrom(), oofem::IncrementalLinearStatic::initializeFrom(), oofem::StaticStructural::initializeFrom(), oofem::FluidMaterialEvaluator::initializeFrom(), oofem::EigenValueDynamic::initializeFrom(), oofem::LinearStability::initializeFrom(), oofem::StaggeredProblem::initializeFrom(), initializeFrom(), oofem::StaggeredProblem::instanciateDefaultMetaStep(), instanciateDefaultMetaStep(), instanciateMetaSteps(), oofem::LinearStability::LinearStability(), oofem::StructuralMaterialEvaluator::solveYourself(), oofem::FluidMaterialEvaluator::solveYourself(), and oofem::StaticStructural::updateAttributes(). Definition at line 278 of file engngm.h. Referenced by EngngModel(), oofem::StaggeredProblem::initializeFrom(), initializeFrom(), and initParallel(). Definition at line 242 of file engngm.h. Referenced by EngngModel(), giveOutputStream(), oofem::IncrementalLinearStatic::initializeFrom(), oofem::EigenValueDynamic::initializeFrom(), oofem::LinearStability::initializeFrom(), oofem::StaggeredProblem::initializeFrom(), initializeFrom(), letOutputBaseFileNameBe(), and ~EngngModel(). List where parallel contexts are stored. Definition at line 311 of file engngm.h. Referenced by oofem::AdaptiveNonLinearStatic::adaptiveRemap(), forceEquationNumbering(), giveParallelContext(), and initParallelContexts(). Flag indicating that the receiver runs in parallel. Definition at line 269 of file engngm.h. Referenced by EngngModel(), initializeFrom(), setParallelMode(), and oofem::DarcyFlow::solveYourselfAt(). Definition at line 255 of file engngm.h. Definition at line 233 of file engngm.h. Referenced by oofem::NLTransientTransportProblem::assembleAlgorithmicPartOfRhs(), oofem::DarcyFlow::giveNextStep(), oofem::NLTransientTransportProblem::giveNextStep(), oofem::StationaryTransportProblem::giveNextStep(), oofem::StructuralMaterialEvaluator::giveNextStep(), oofem::LinearStatic::giveNextStep(), oofem::DEIDynamic::giveNextStep(), oofem::IncrementalLinearStatic::giveNextStep(), oofem::FluidMaterialEvaluator::giveNextStep(), oofem::FreeWarping::giveNextStep(), oofem::EigenValueDynamic::giveNextStep(), oofem::StaticStructural::giveNextStep(), oofem::DIIDynamic::giveNextStep(), oofem::TransientTransportProblem::giveNextStep(), oofem::LinearStability::giveNextStep(), oofem::StokesFlow::giveNextStep(), oofem::NonLinearDynamic::giveNextStep(), oofem::NlDEIDynamic::giveNextStep(), oofem::NonStationaryTransportProblem::giveNextStep(), oofem::NonLinearStatic::giveNextStep(), oofem::SUPG::giveNextStep(), oofem::StaggeredProblem::giveNextStep(), oofem::CBS::giveNextStep(), oofem::NLTransientTransportProblem::giveUnknownComponent(), oofem::AdaptiveNonLinearStatic::initializeAdaptiveFrom(), and restoreContext(). Definition at line 283 of file engngm.h. Referenced by oofem::StaggeredProblem::initializeFrom(), initializeFrom(), and initParallel(). Profile optimized numbering flag (using Sloan's algorithm). Definition at line 221 of file engngm.h. Referenced by EngngModel(), forceEquationNumbering(), and initializeFrom(). Definition at line 257 of file engngm.h. Referenced by EngngModel(), oofem::NonLinearDynamic::giveNextStep(), and oofem::NonLinearStatic::giveNextStep(). Definition at line 276 of file engngm.h. Referenced by EngngModel(), errorInfo(), oofem::StaggeredProblem::initializeFrom(), initializeFrom(), and initParallel(). String with reference file name. Definition at line 244 of file engngm.h. Referenced by EngngModel(), and instanciateYourself(). Renumbering flag (renumbers equations after each step, necessary if Dirichlet BCs change). Definition at line 219 of file engngm.h. Referenced by EngngModel(), oofem::StaggeredProblem::initializeFrom(), initializeFrom(), restoreContext(), and saveContext(). Definition at line 316 of file engngm.h. Referenced by oofem::IncrementalLinearStatic::initializeFrom(), oofem::EigenValueDynamic::initializeFrom(), oofem::LinearStability::initializeFrom(), oofem::StaggeredProblem::initializeFrom(), initializeFrom(), and instanciateYourself(). Definition at line 259 of file engngm.h. Definition at line 229 of file engngm.h. Referenced by oofem::TransientTransportProblem::giveSolutionStepWhenIcApply(), oofem::NonLinearStatic::giveSolutionStepWhenIcApply(), oofem::NonStationaryTransportProblem::giveSolutionStepWhenIcApply(), oofem::SUPG::giveSolutionStepWhenIcApply(), oofem::StaggeredProblem::giveSolutionStepWhenIcApply(), oofem::CBS::giveSolutionStepWhenIcApply(), oofem::DIIDynamic::initializeYourself(), oofem::NonLinearDynamic::initializeYourself(), oofem::NLTransientTransportProblem::solveYourselfAt(), oofem::SUPG::solveYourselfAt(), and oofem::CBS::solveYourselfAt(). Definition at line 314 of file engngm.h. Referenced by oofem::EigenValueDynamic::doStepOutput(), oofem::LinearStability::doStepOutput(), doStepOutput(), EngngModel(), oofem::StructuralMaterialEvaluator::initializeFrom(), oofem::IncrementalLinearStatic::initializeFrom(), oofem::EigenValueDynamic::initializeFrom(), oofem::LinearStability::initializeFrom(), oofem::StaggeredProblem::initializeFrom(), initializeFrom(), letOutputBaseFileNameBe(), oofem::StaggeredProblem::solveYourself(), solveYourself(), terminate(), and terminateAnalysis(). Definition at line 267 of file engngm.h. Referenced by oofem::AdaptiveNonLinearStatic::adaptiveRemap(), oofem::NonLinearDynamic::assemble(), oofem::NonLinearStatic::assemble(), assemble(), assembleExtrapolatedForces(), assemblePrescribedExtrapolatedForces(), assembleVectorFromBC(), assembleVectorFromDofManagers(), assembleVectorFromElements(), balanceLoad(), forceEquationNumbering(), giveAnalysisTime(), giveSolutionStepTime(), oofem::AdaptiveNonLinearStatic::initializeAdaptiveFrom(), oofem::StructuralMaterialEvaluator::solveYourself(), oofem::FluidMaterialEvaluator::solveYourself(), oofem::LinearStability::solveYourself(), oofem::StaggeredProblem::solveYourself(), solveYourself(), oofem::SUPG::solveYourselfAt(), oofem::CBS::solveYourselfAt(), terminateAnalysis(), and oofem::NonLinearDynamic::updateComponent().